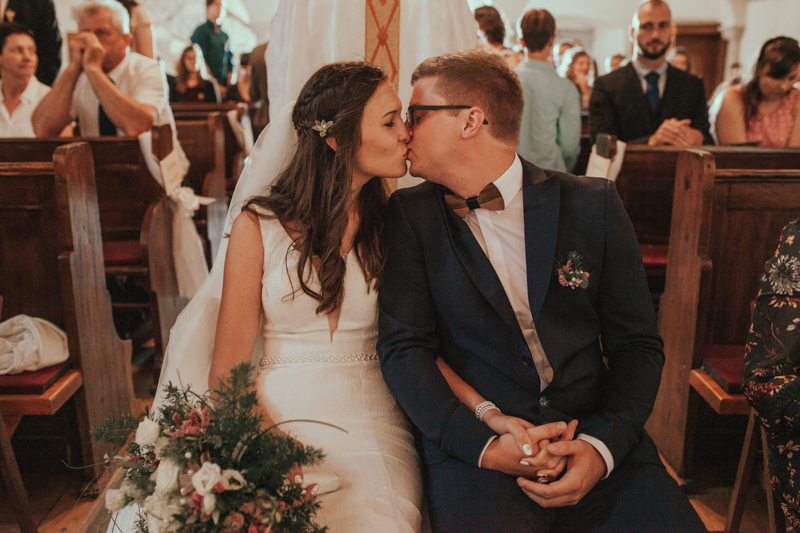 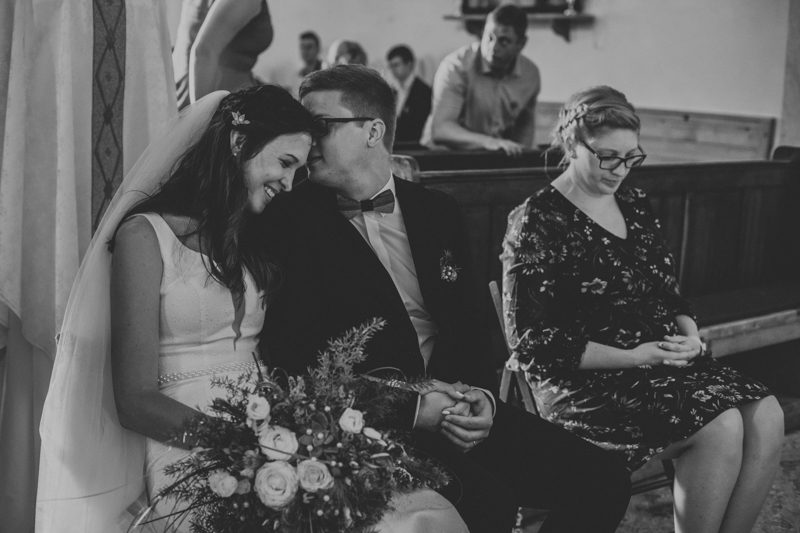 These two pictured a relaxed and intimate wedding ceremony, surrounded by their loved ones. 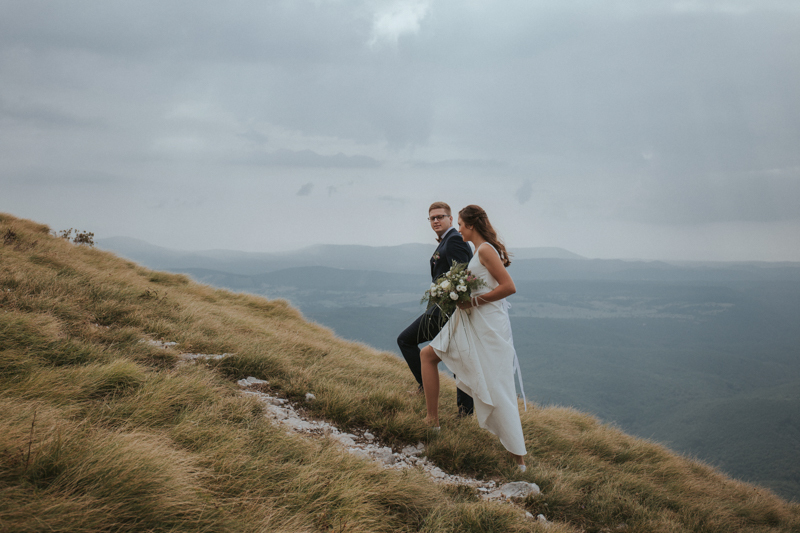 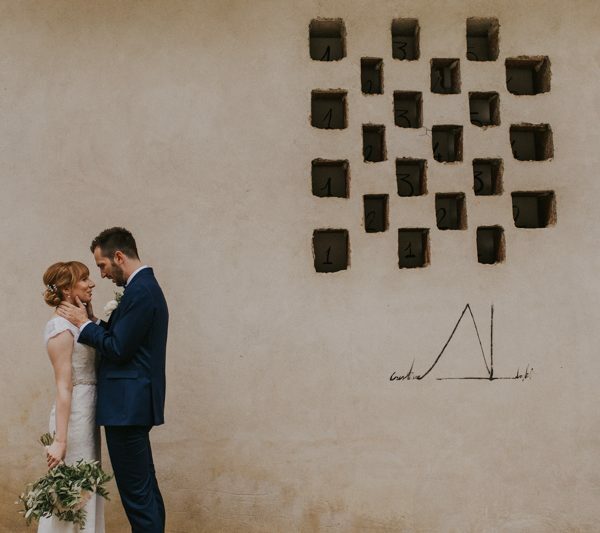 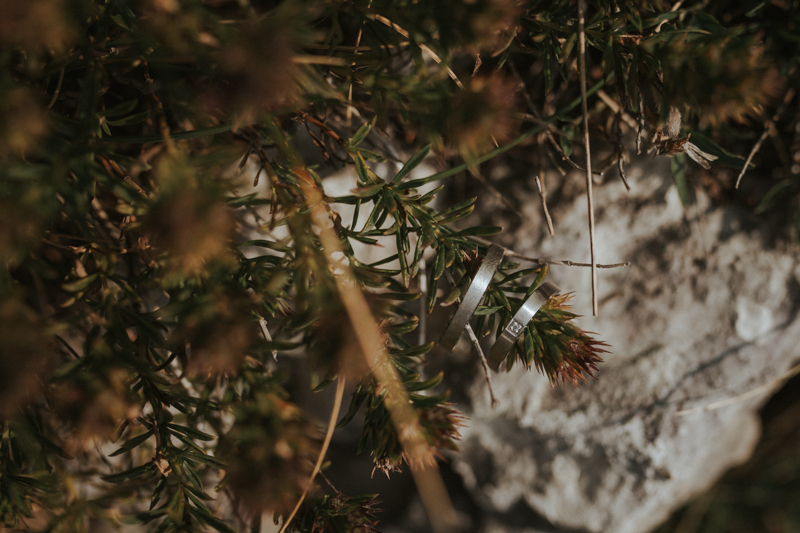 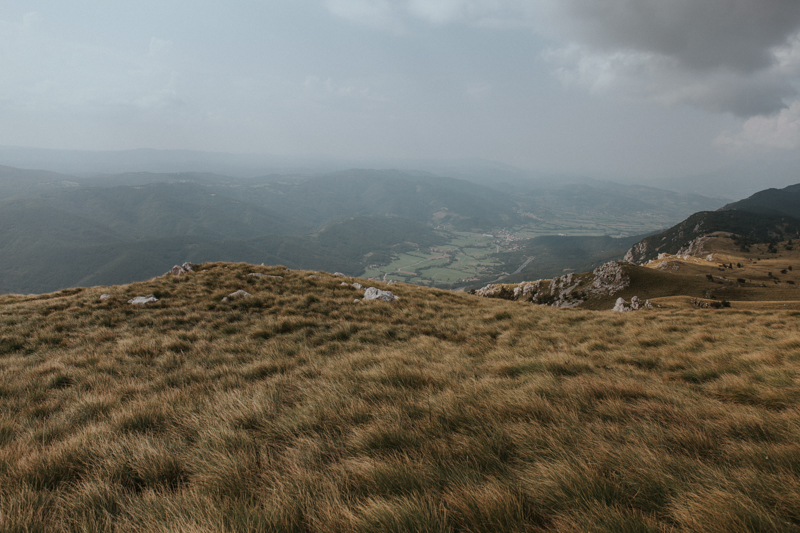 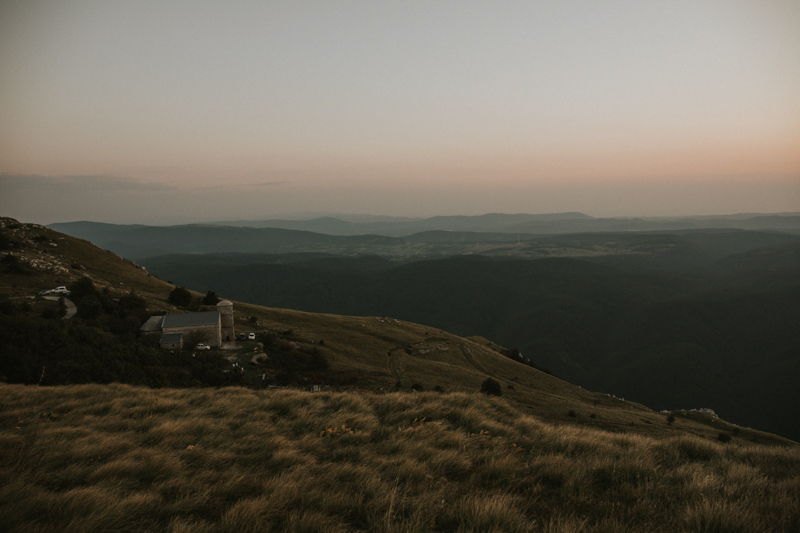 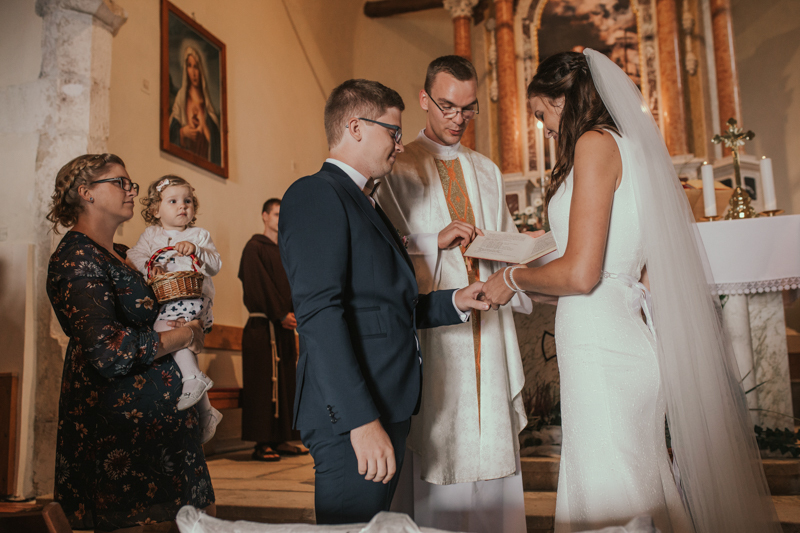 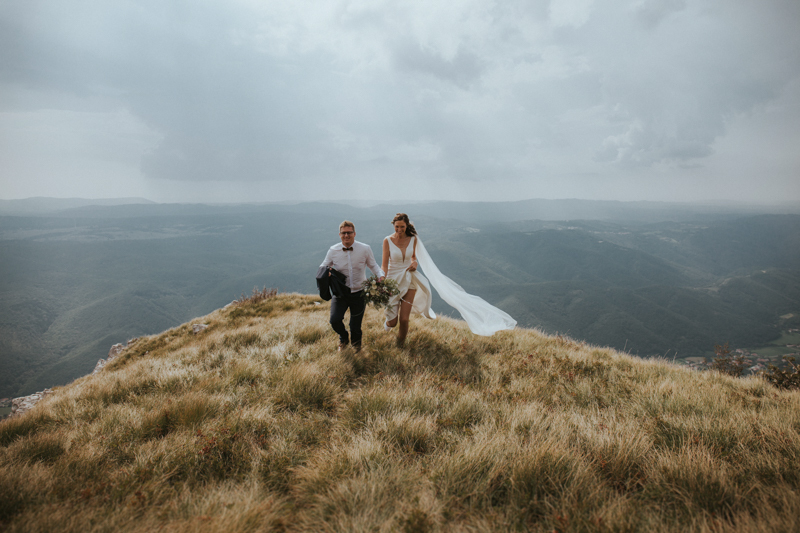 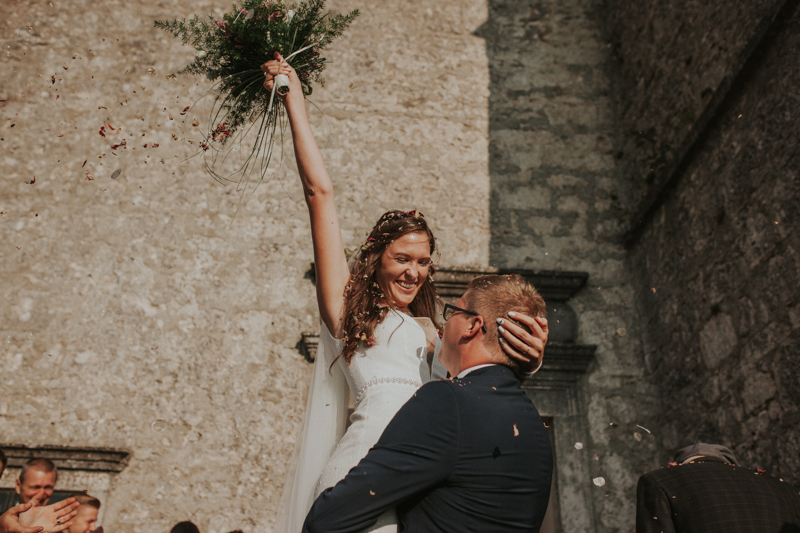 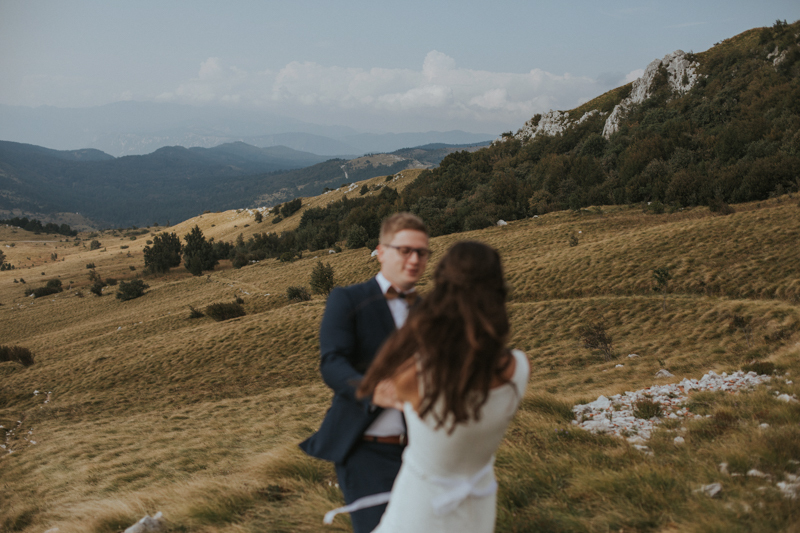 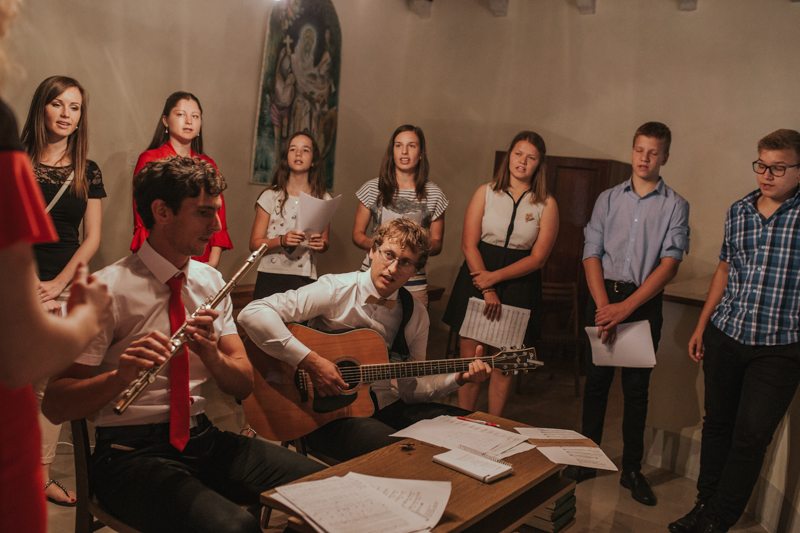 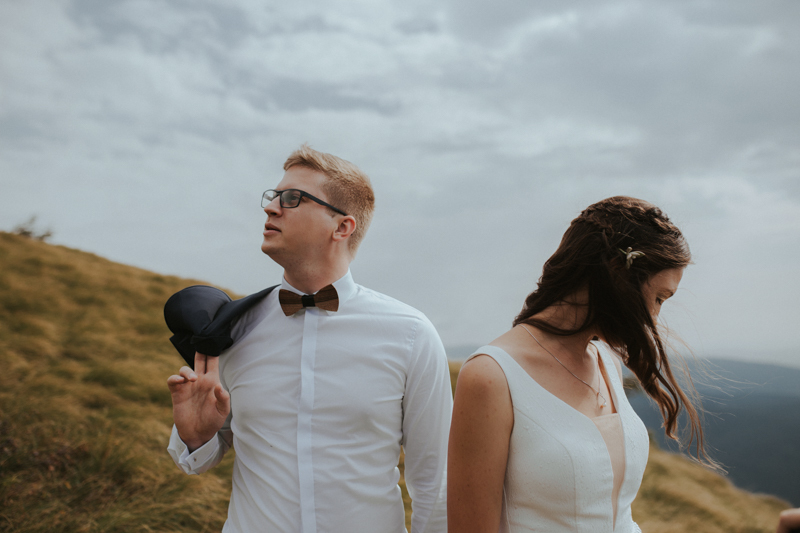 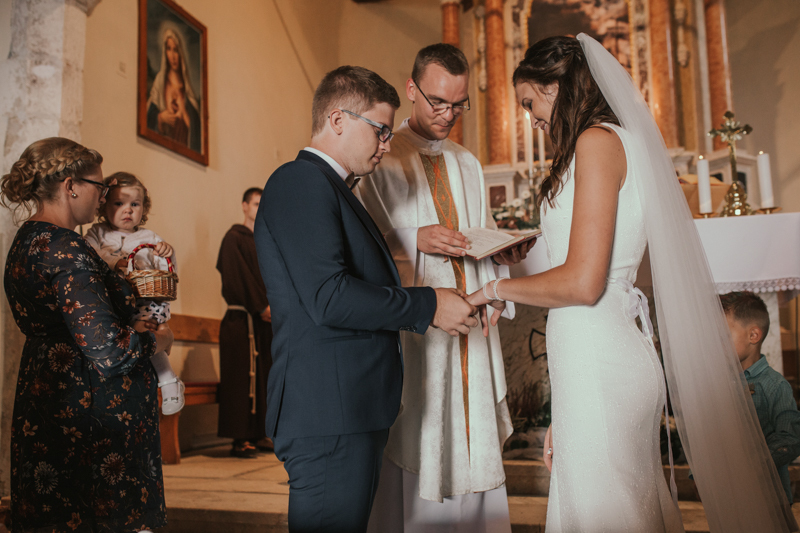 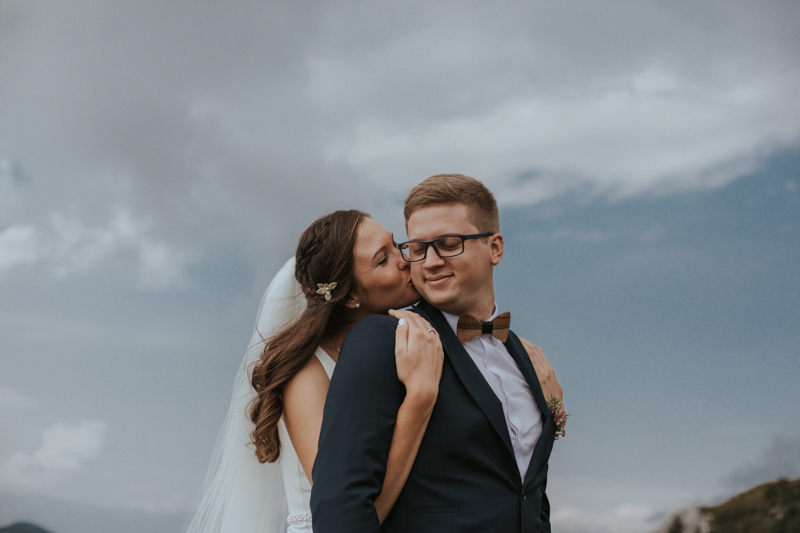 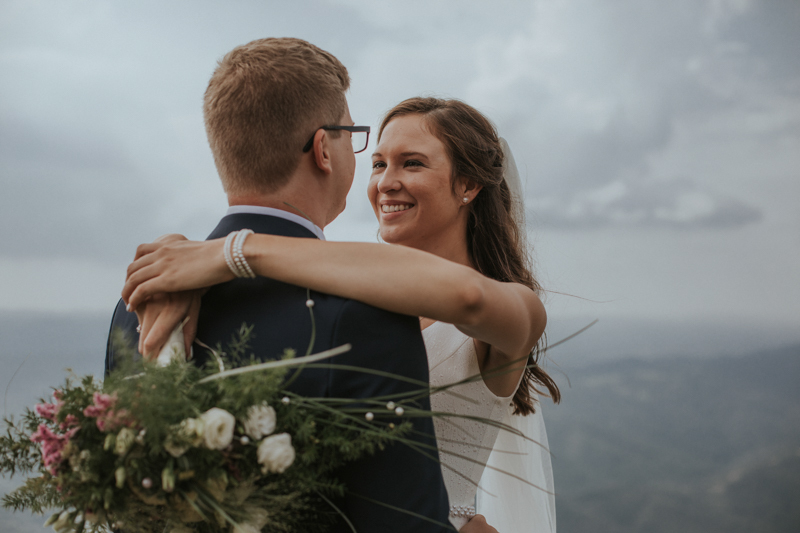 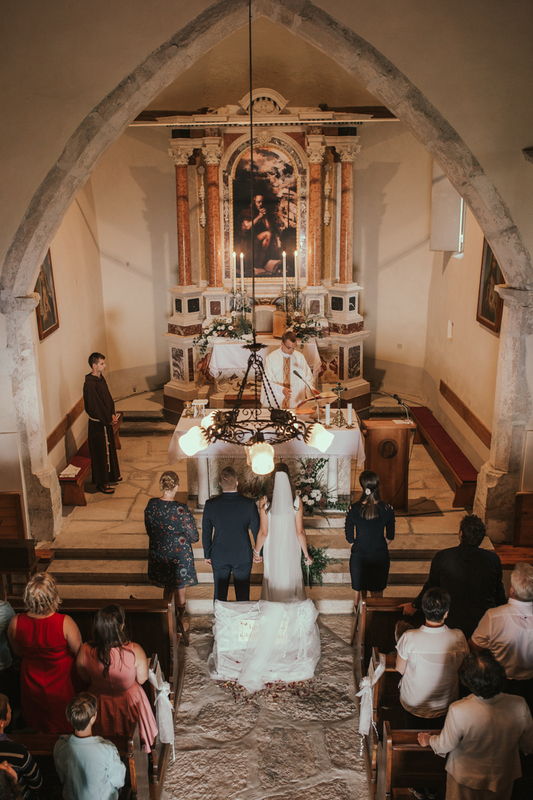 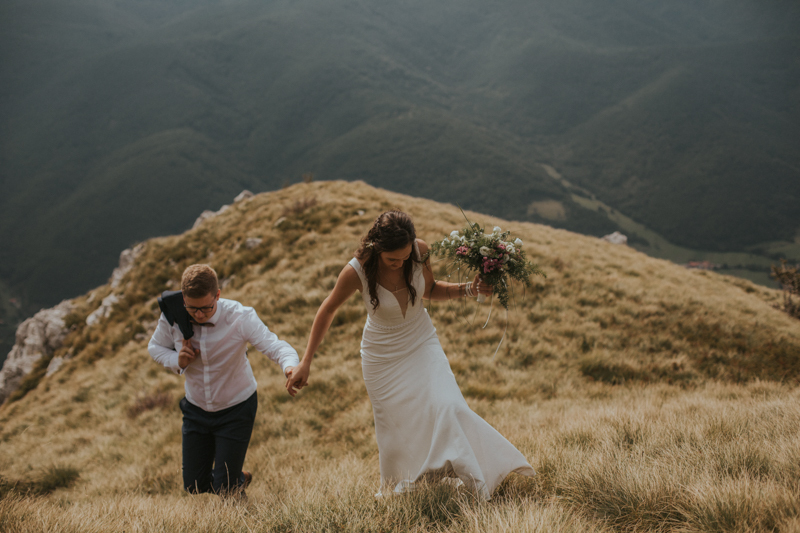 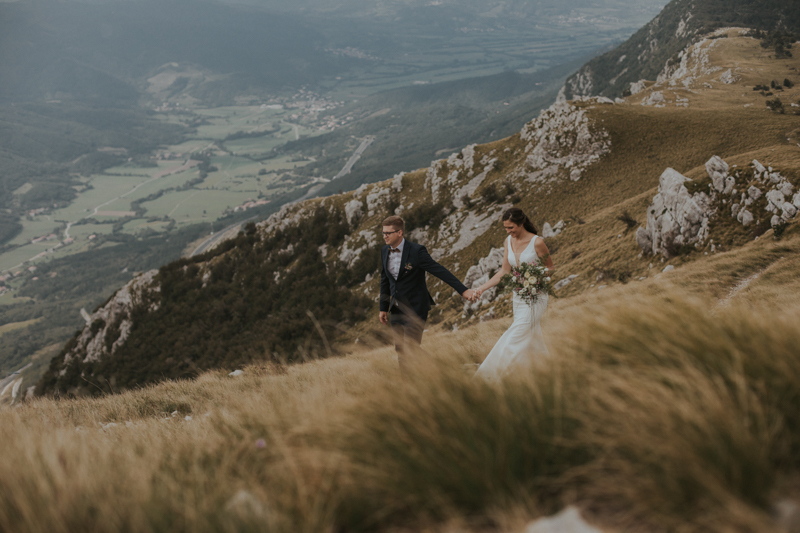 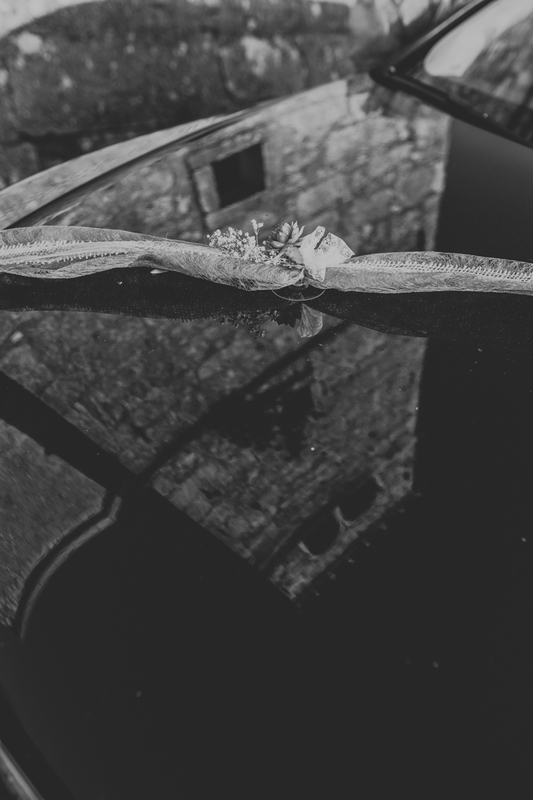 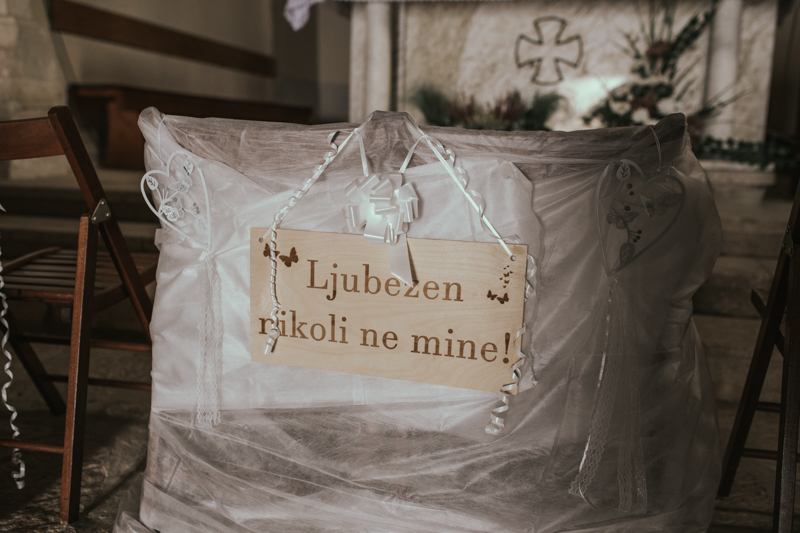 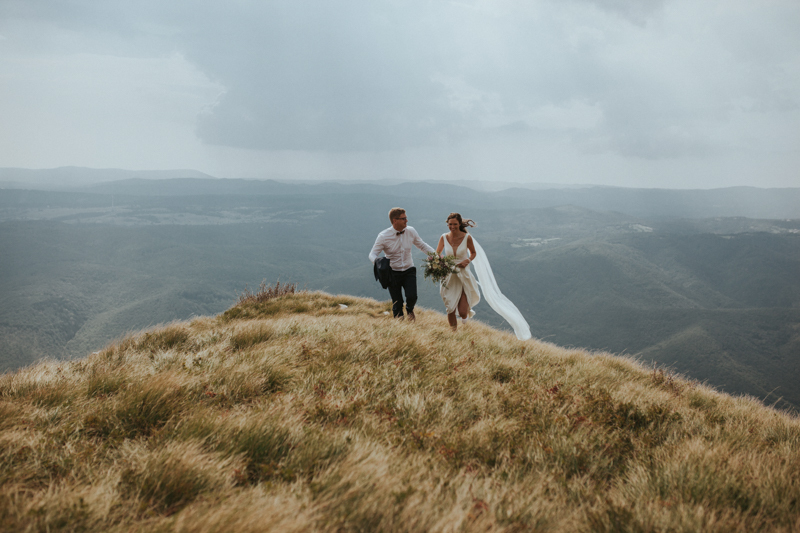 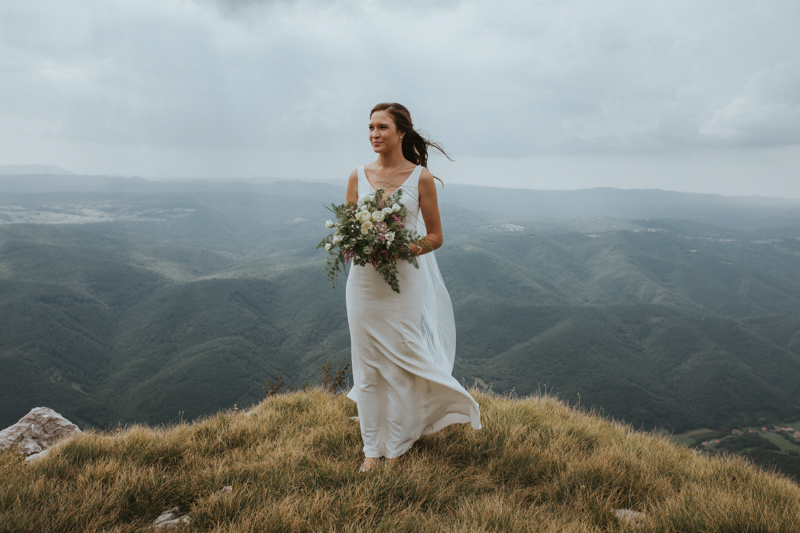 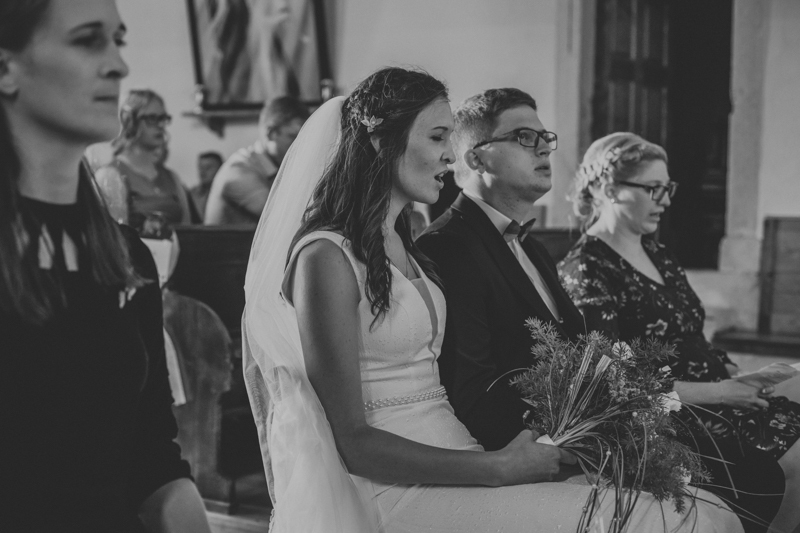 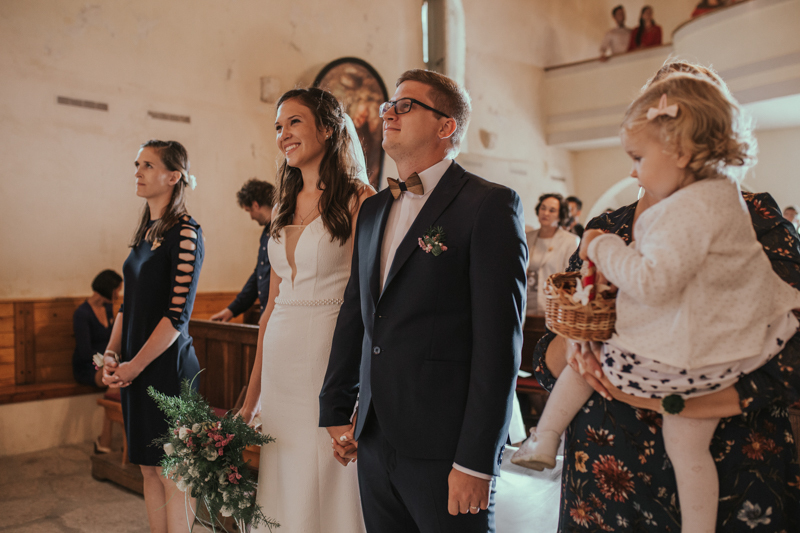 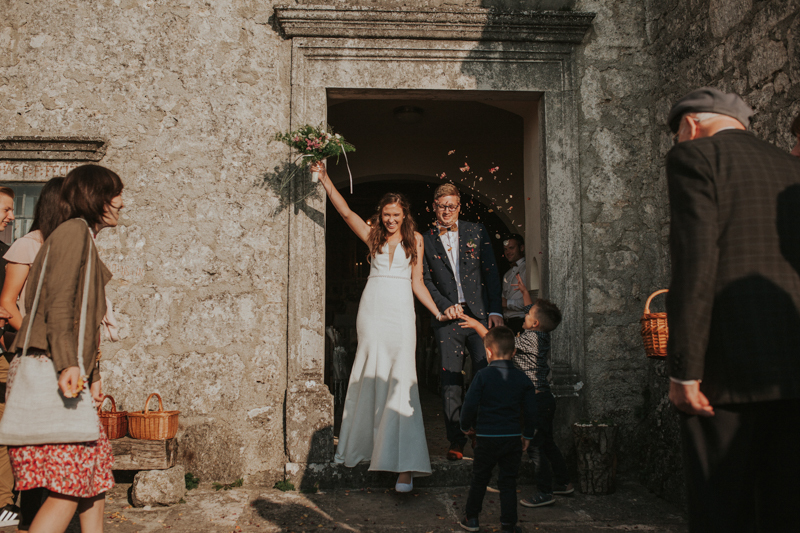 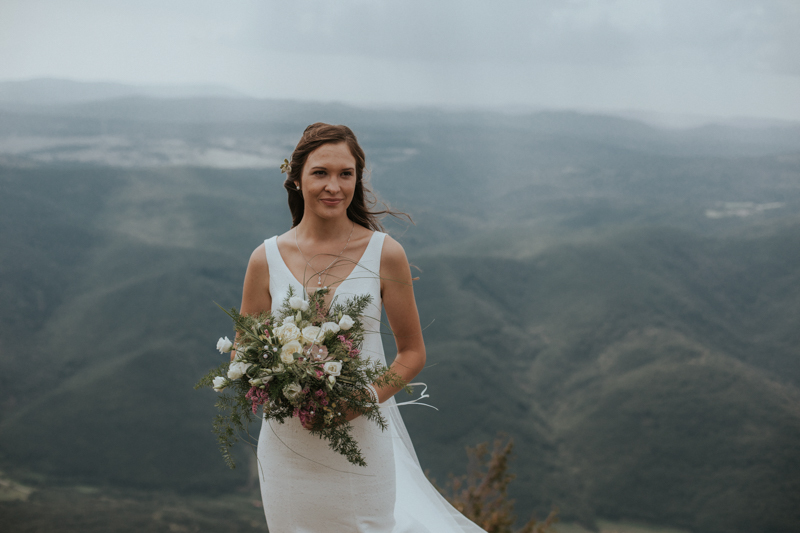 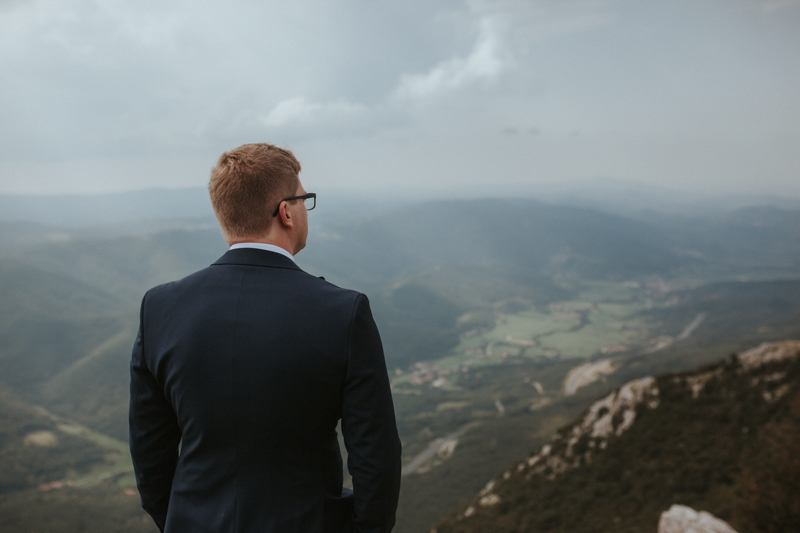 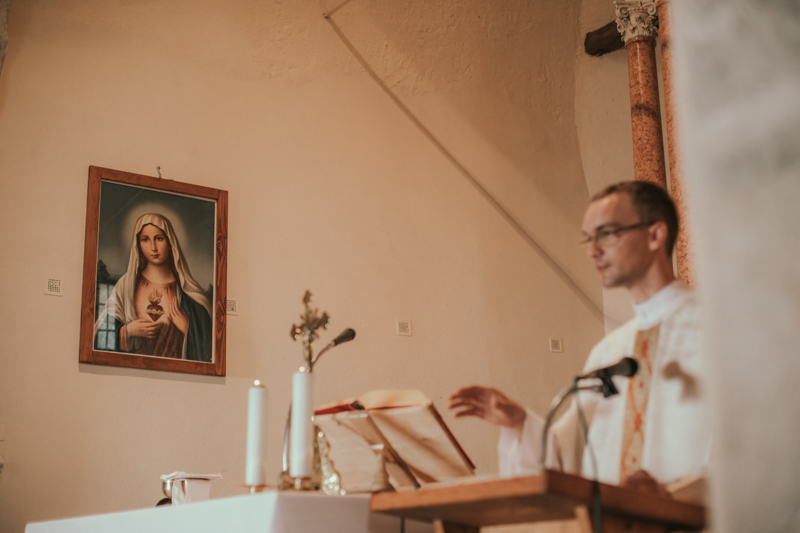 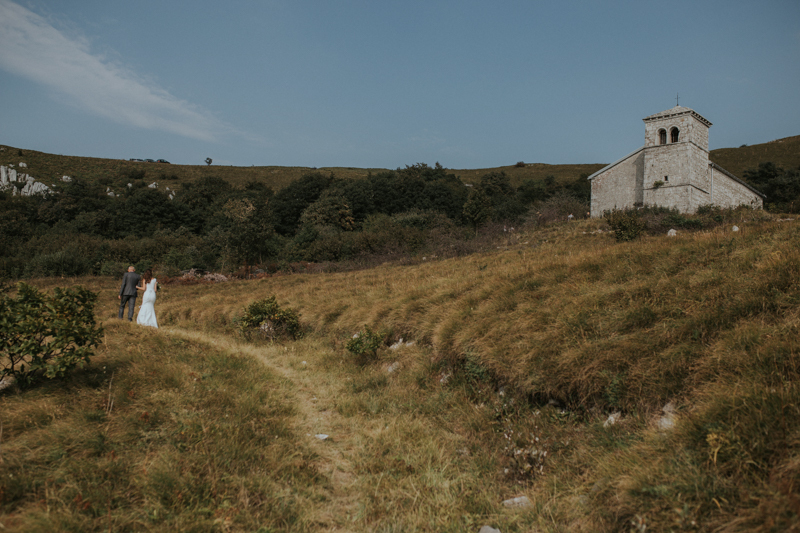 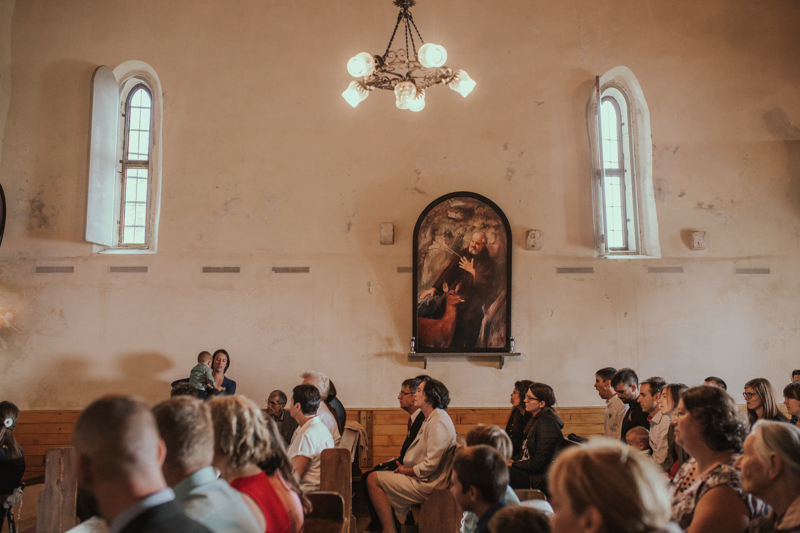 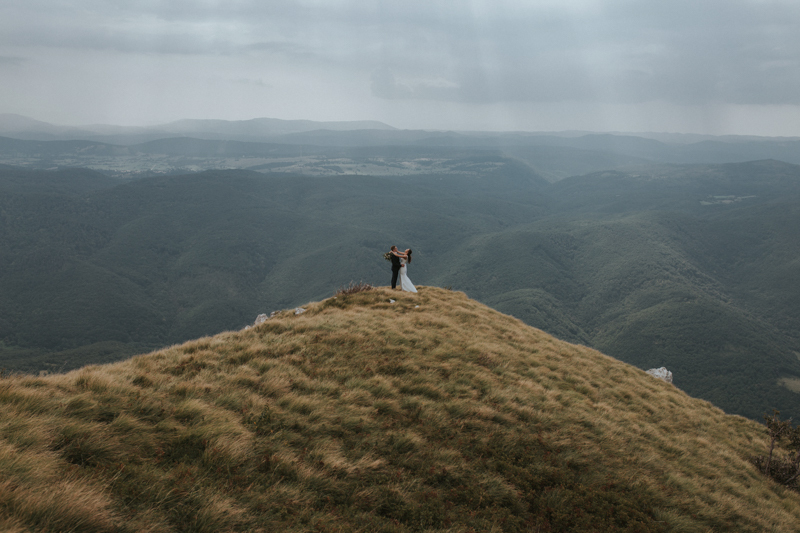 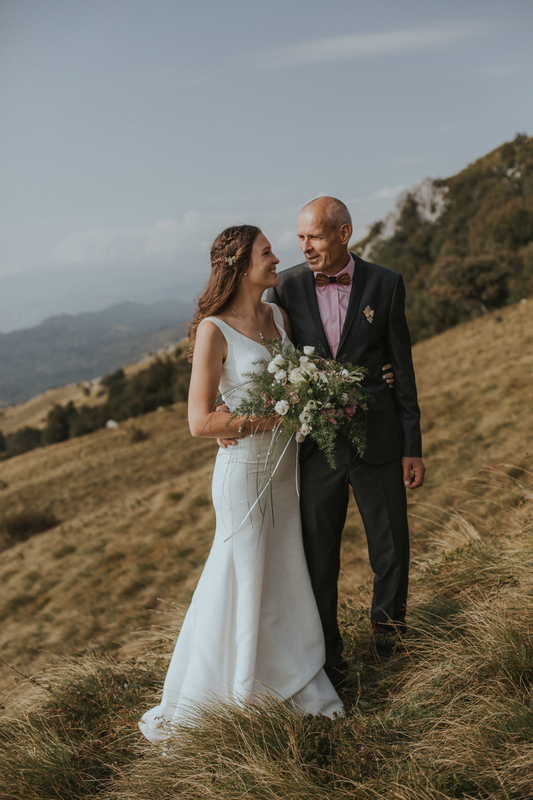 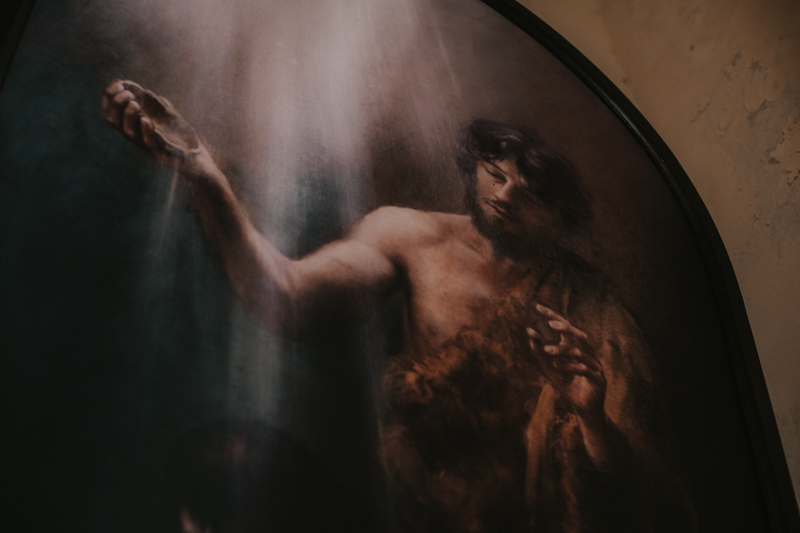 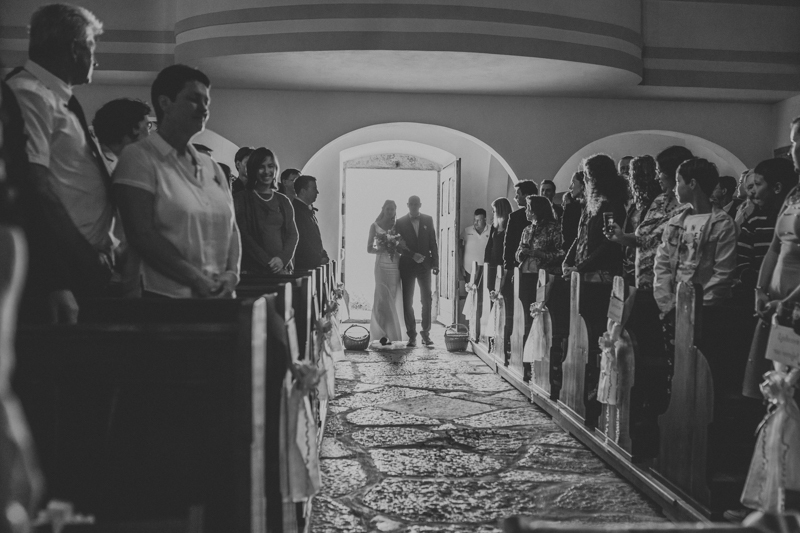 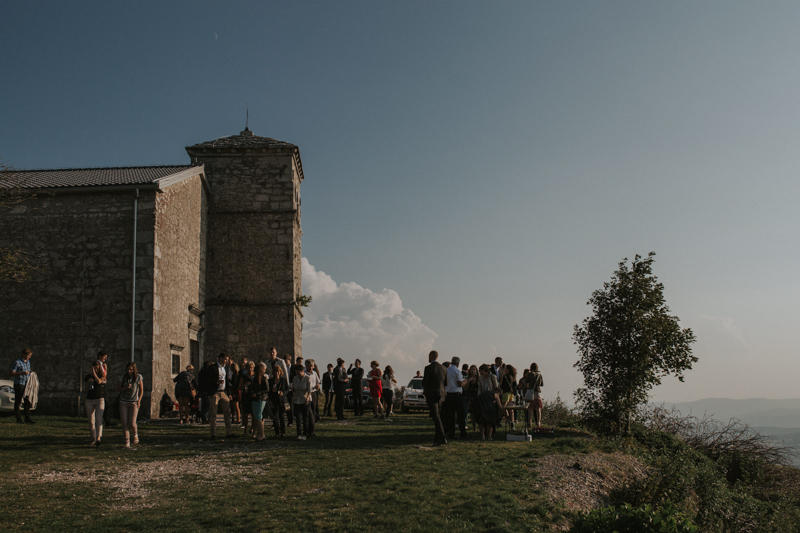 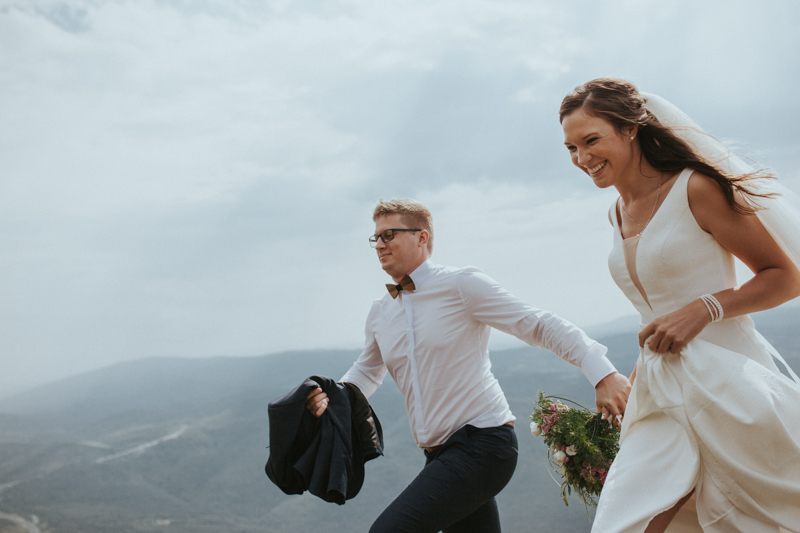 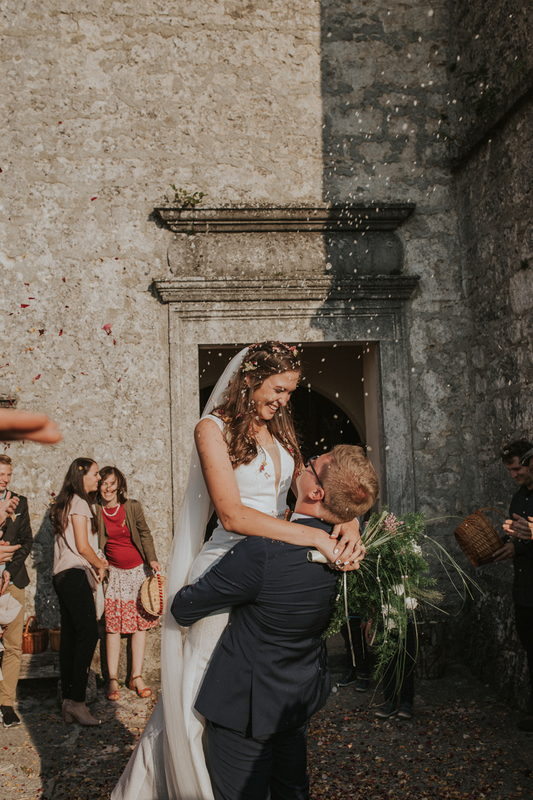 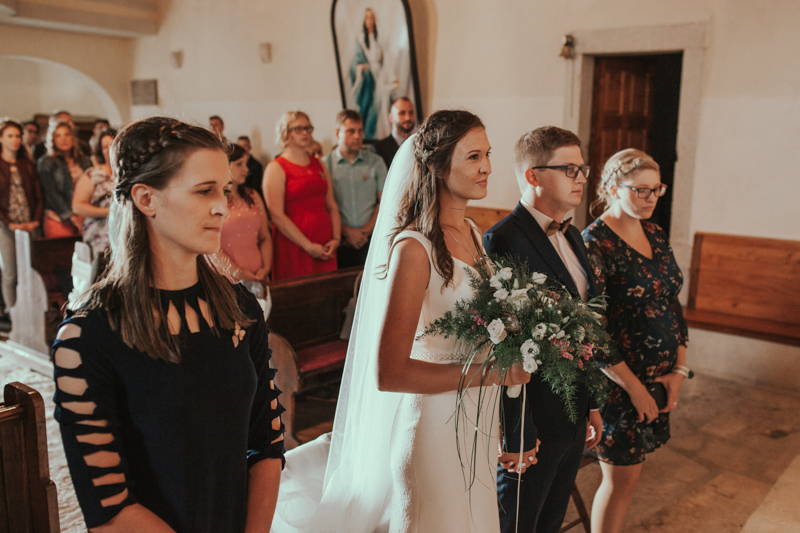 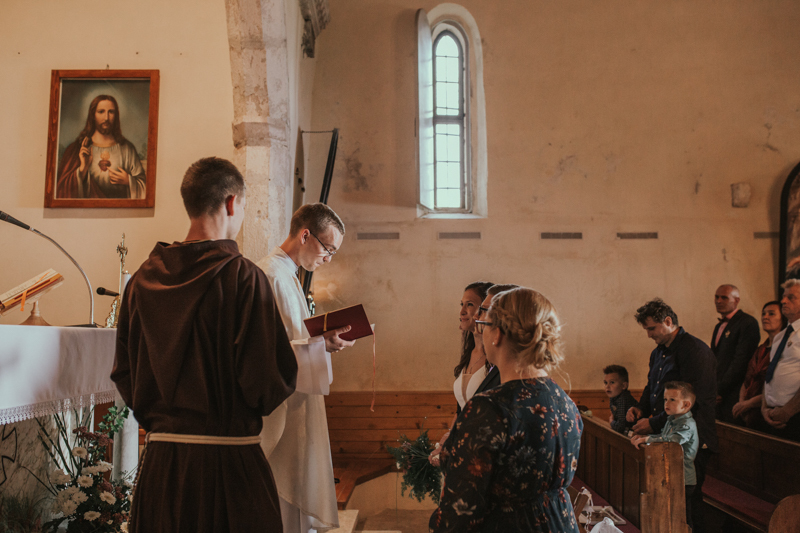 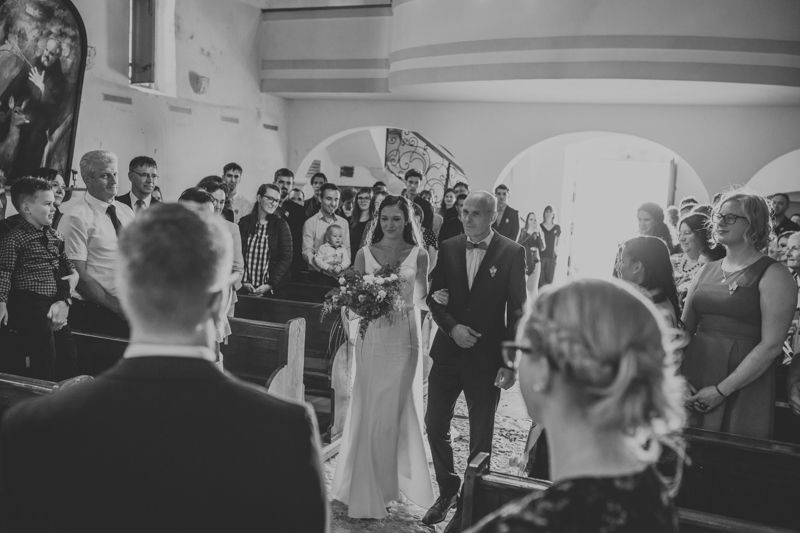 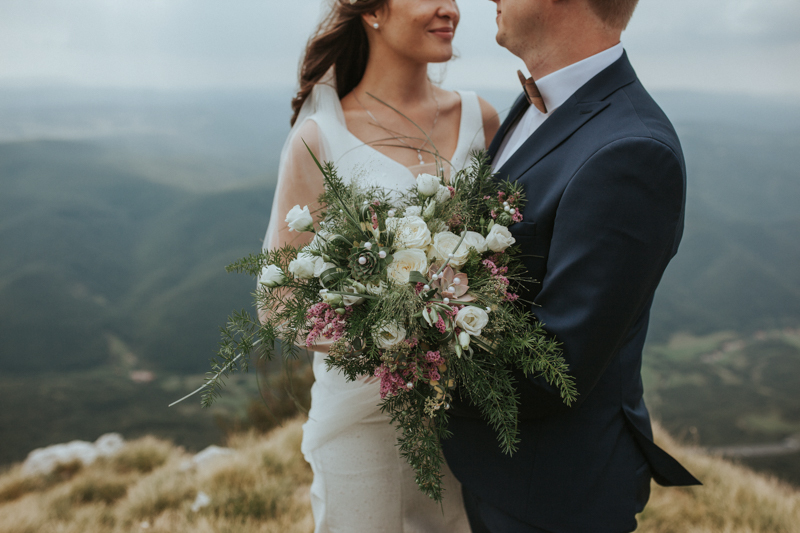 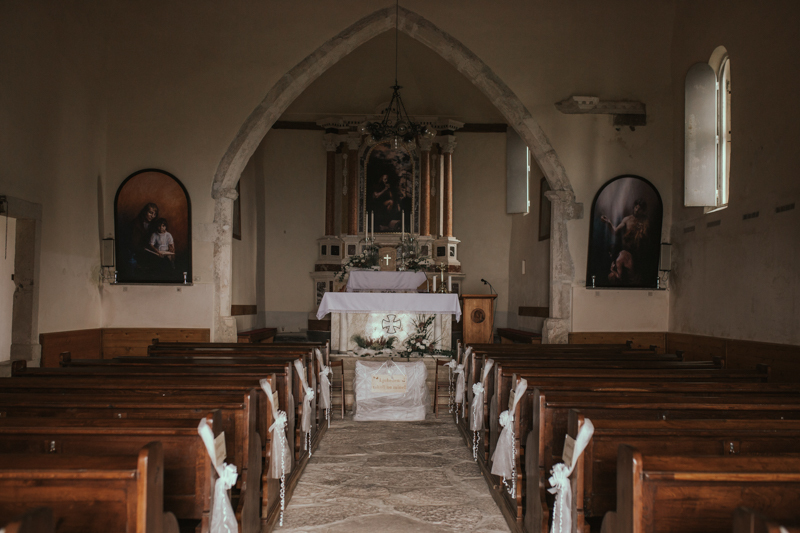 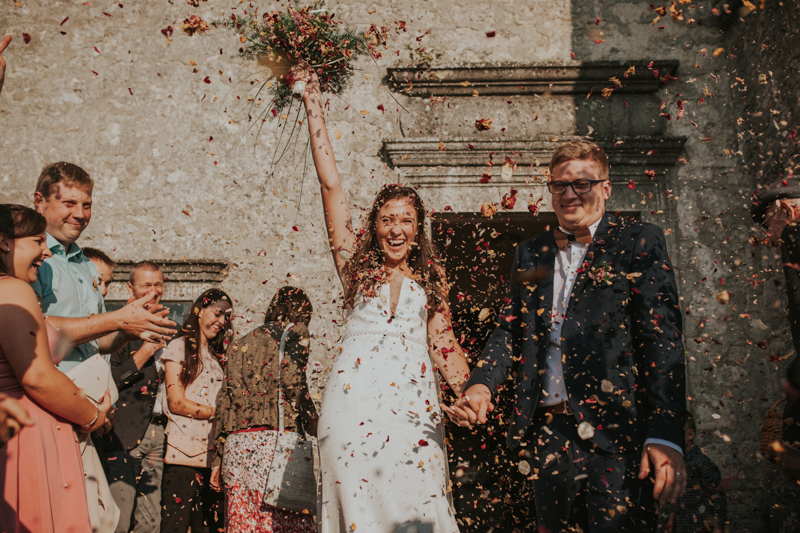 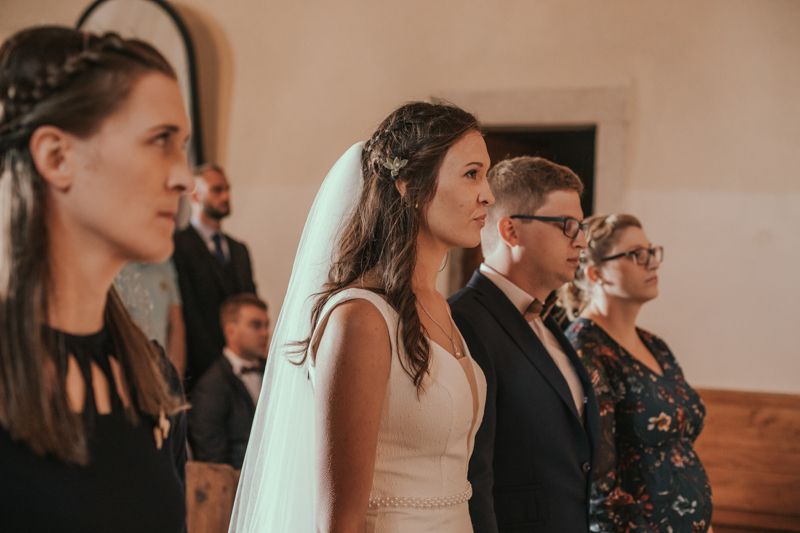 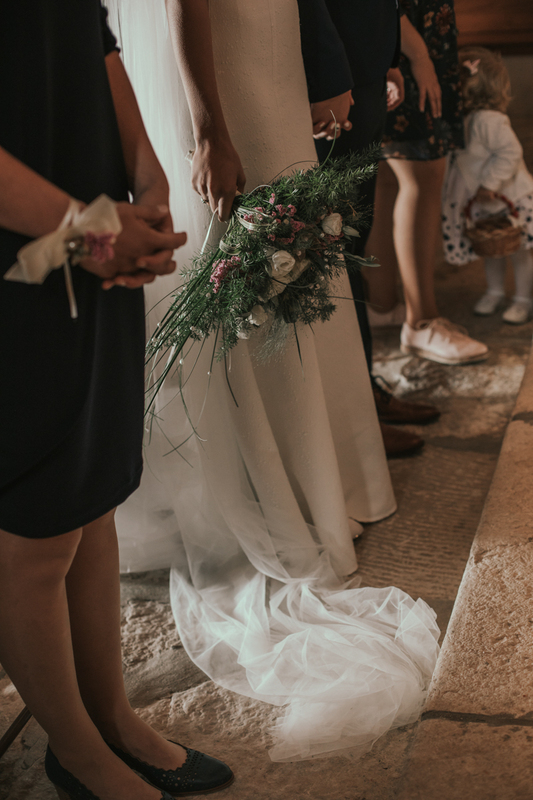 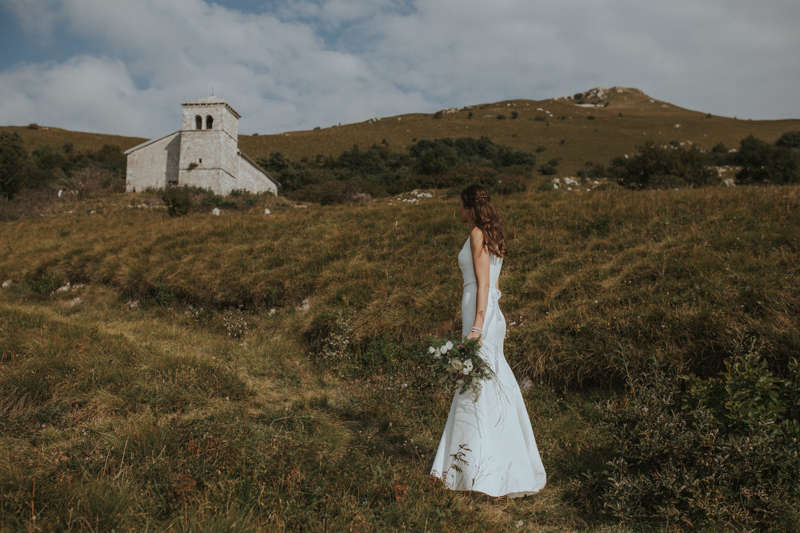 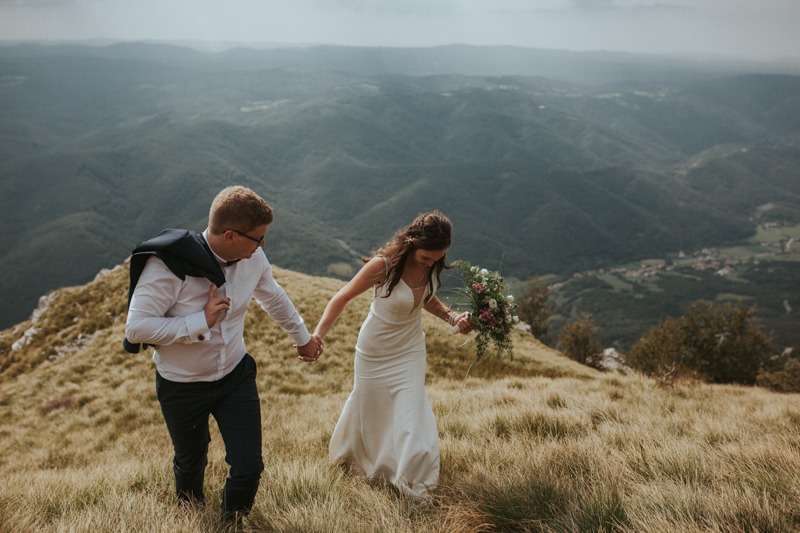 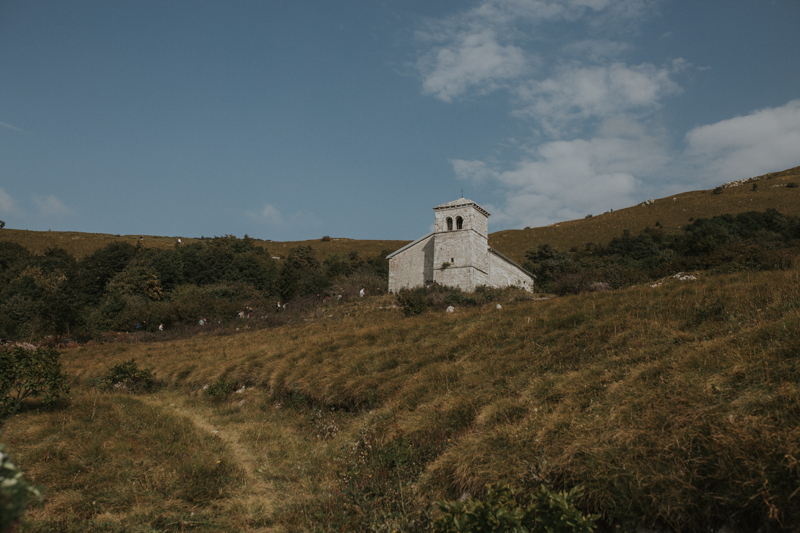 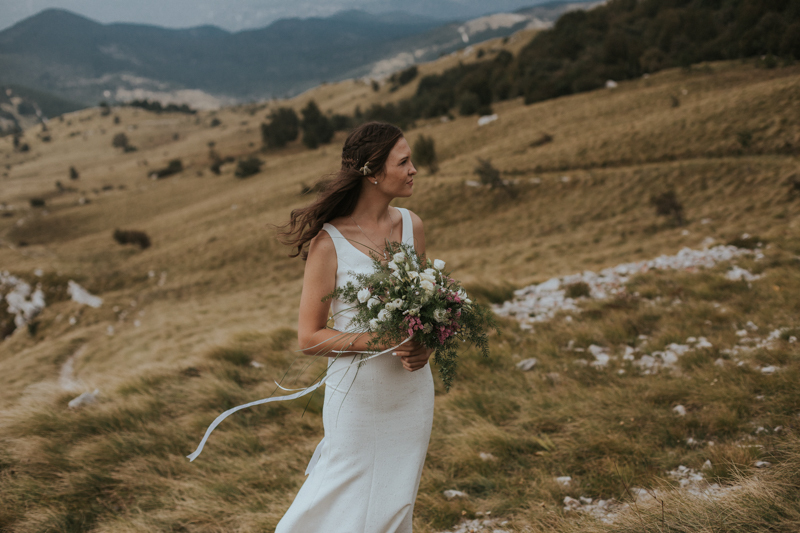 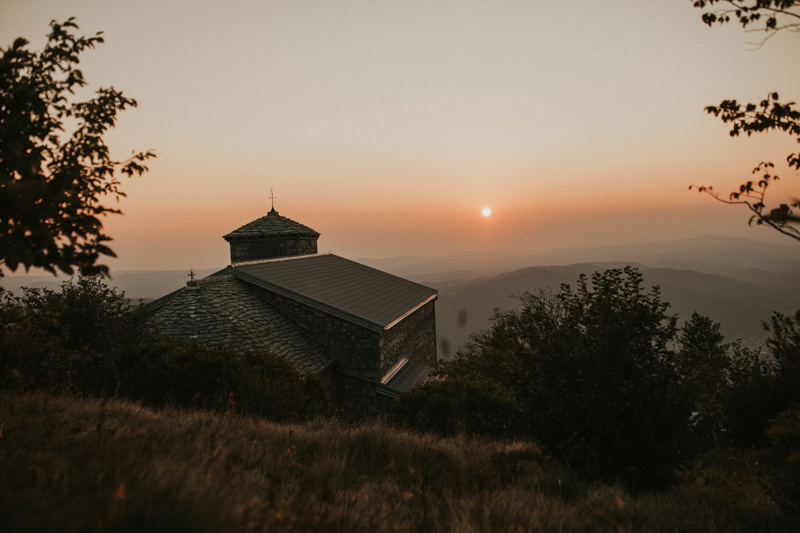 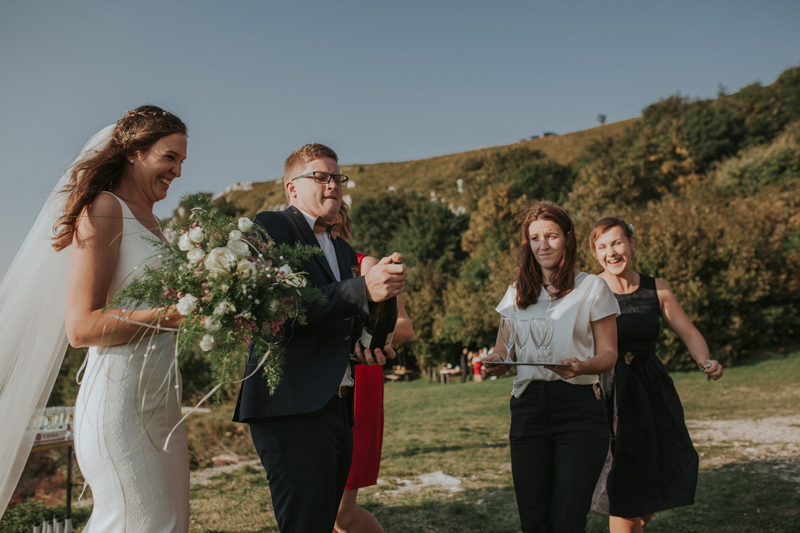 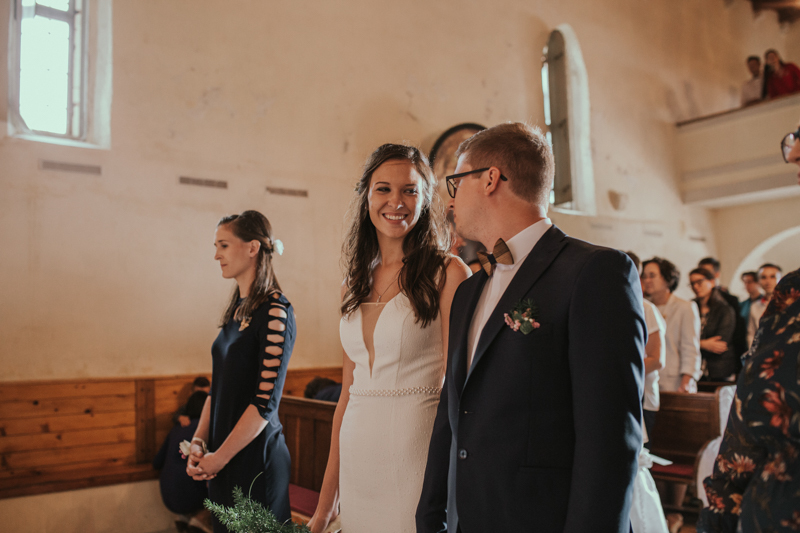 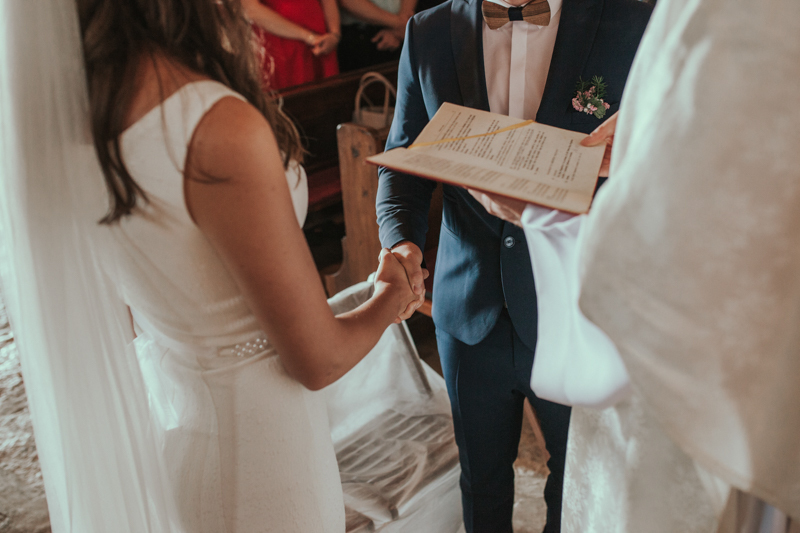 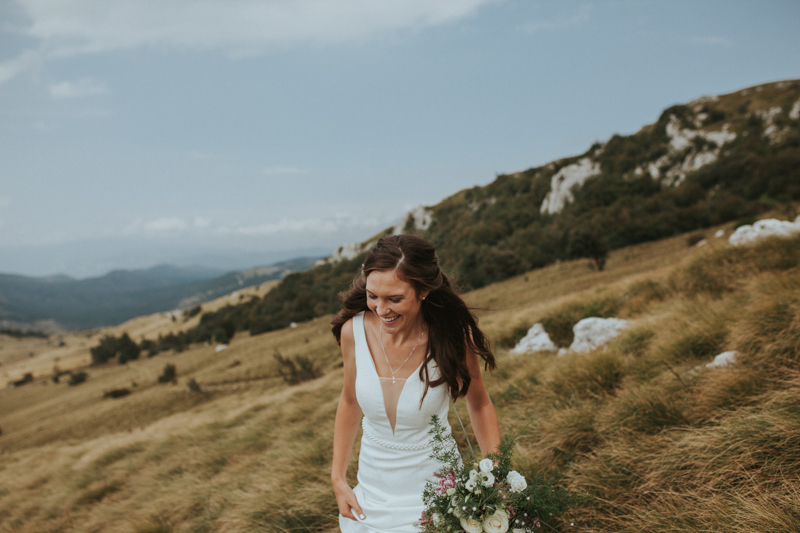 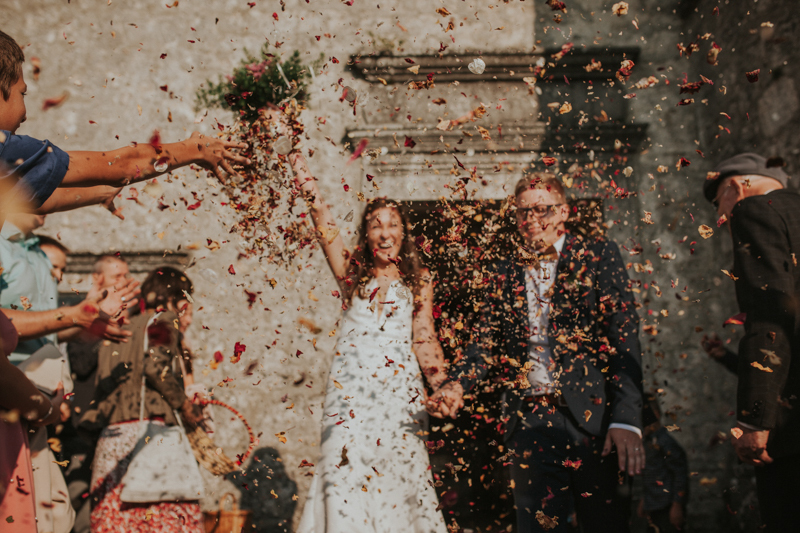 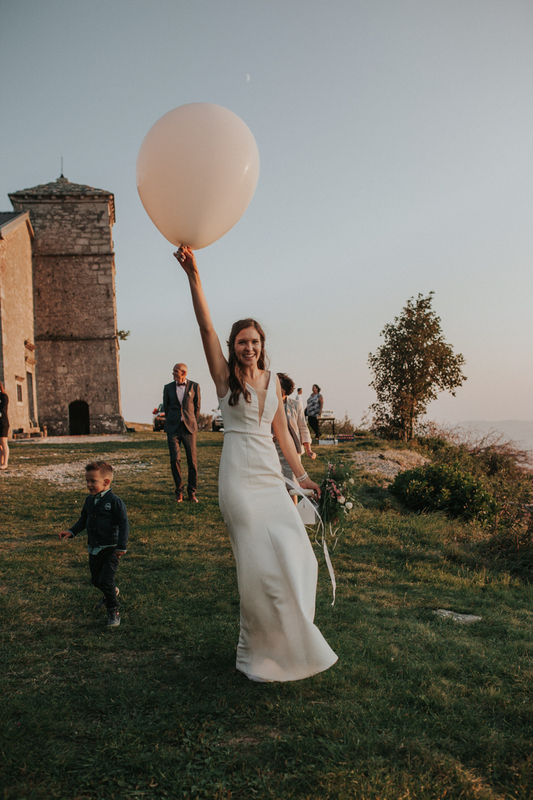 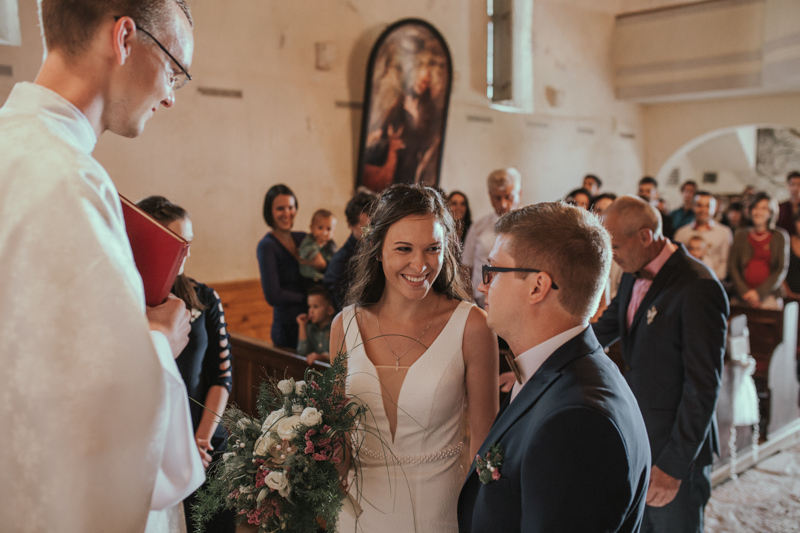 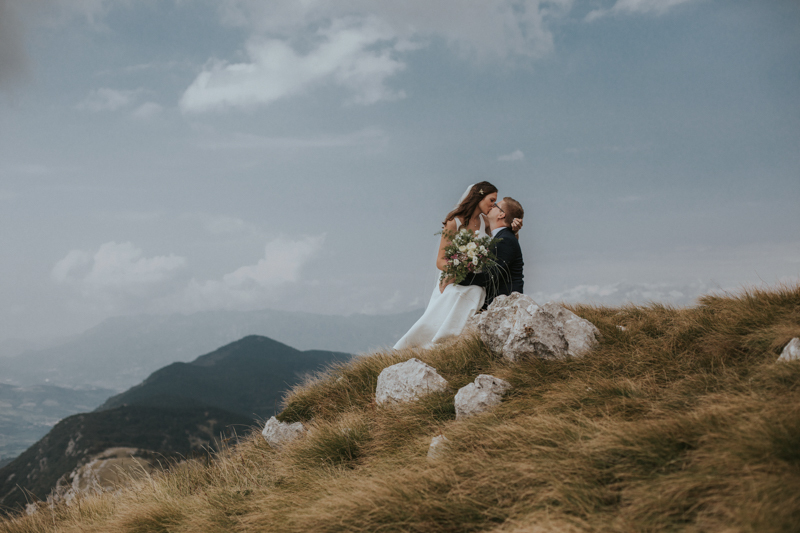 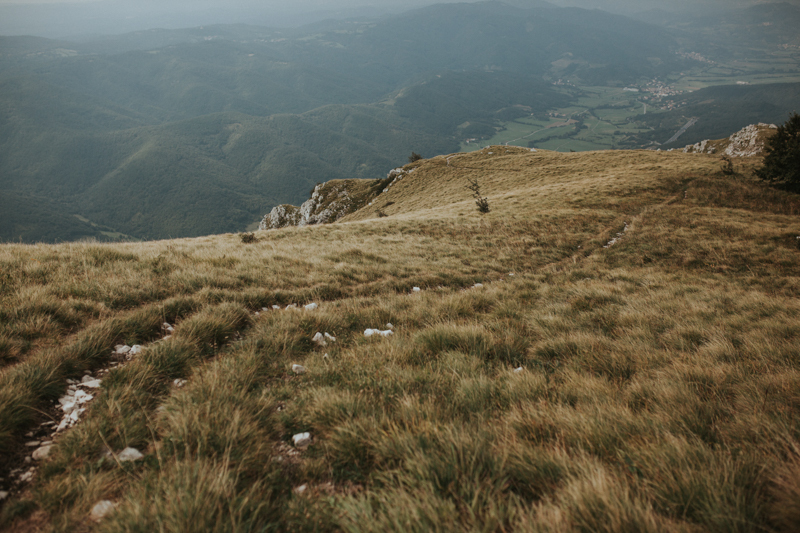 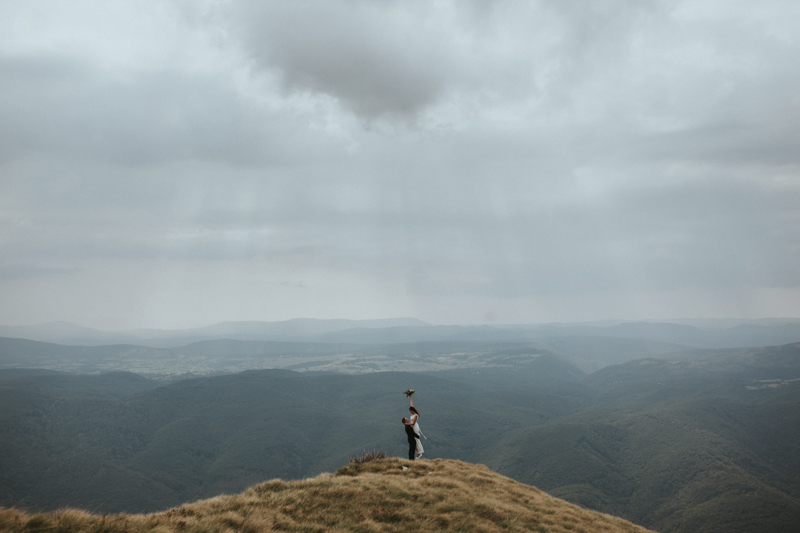 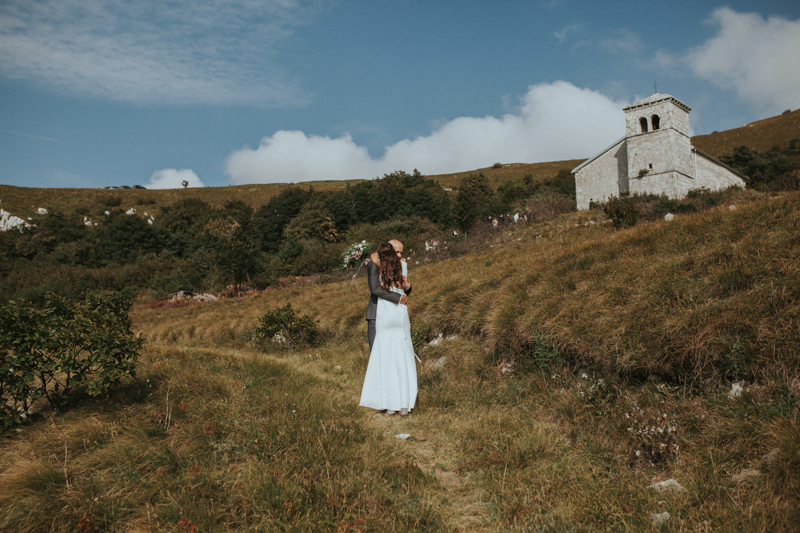 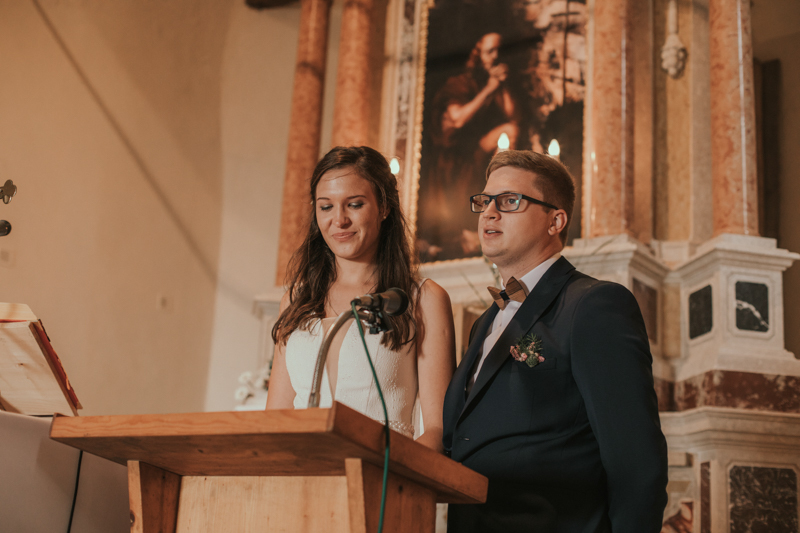 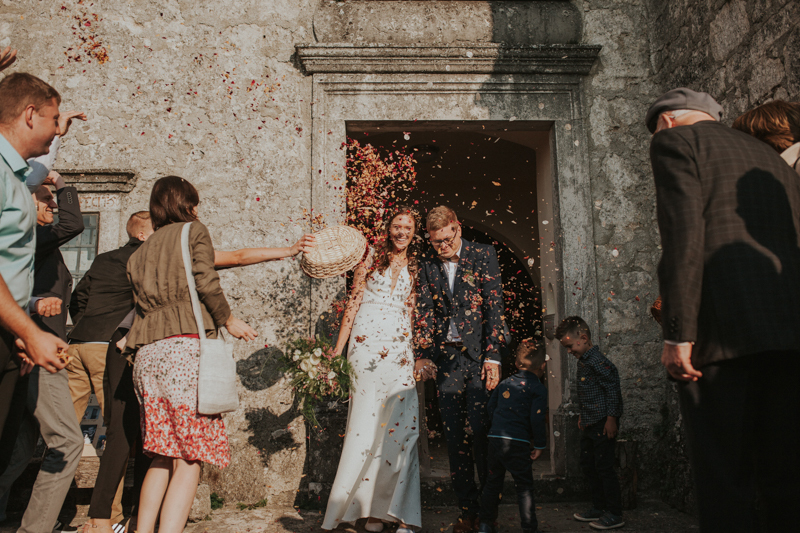 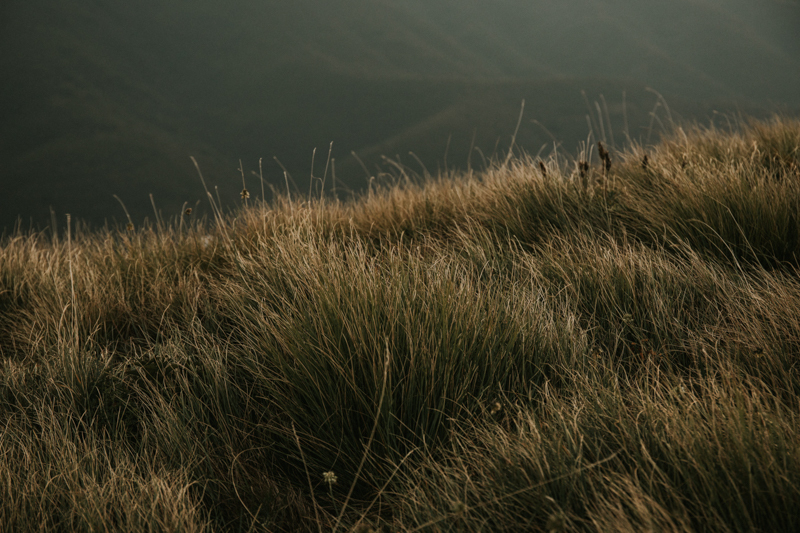 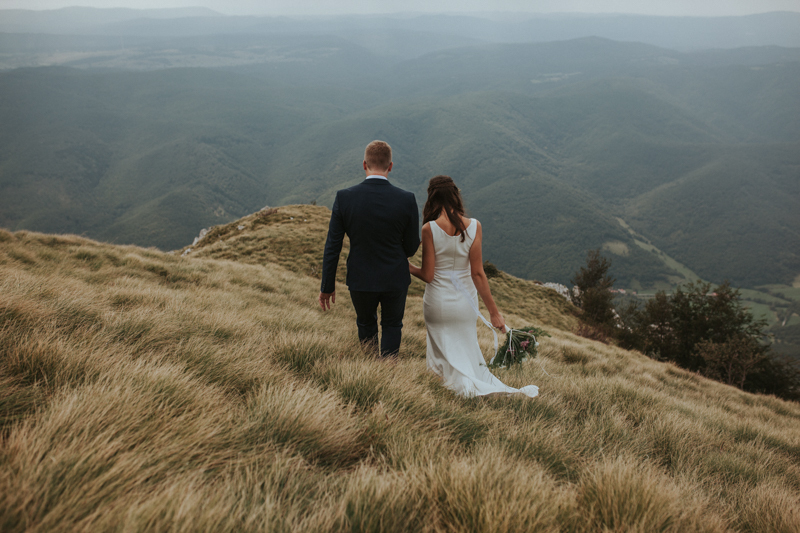 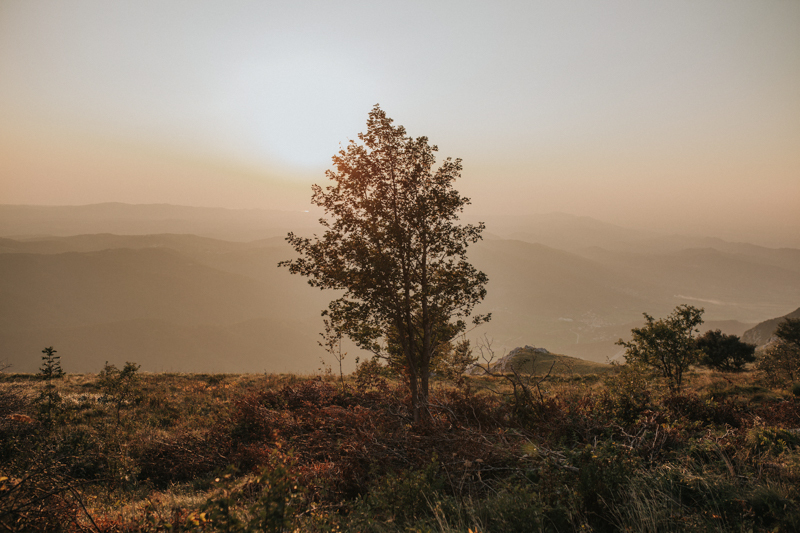 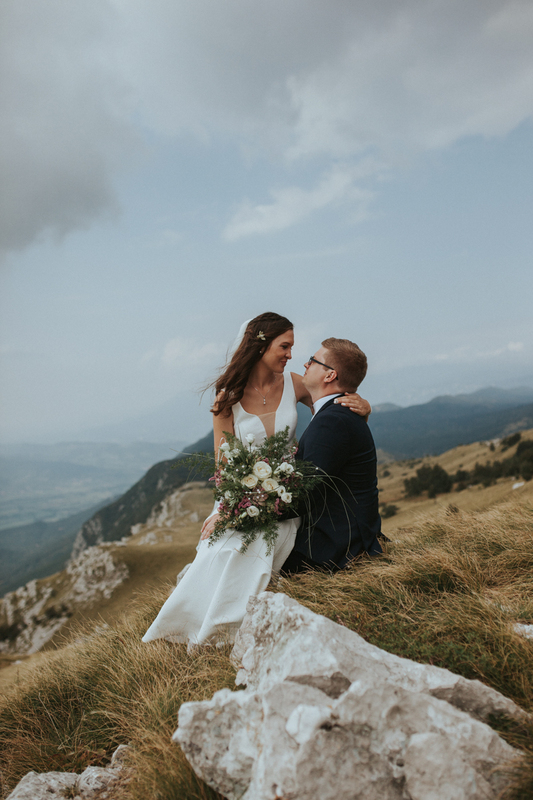 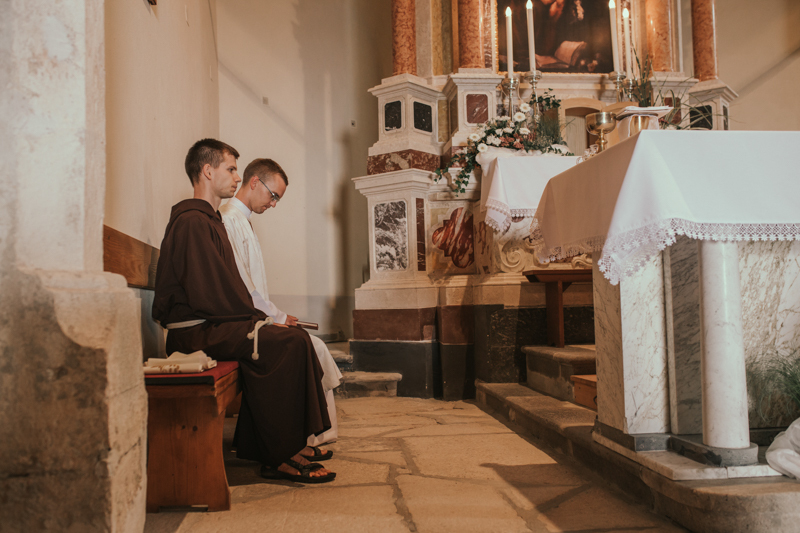 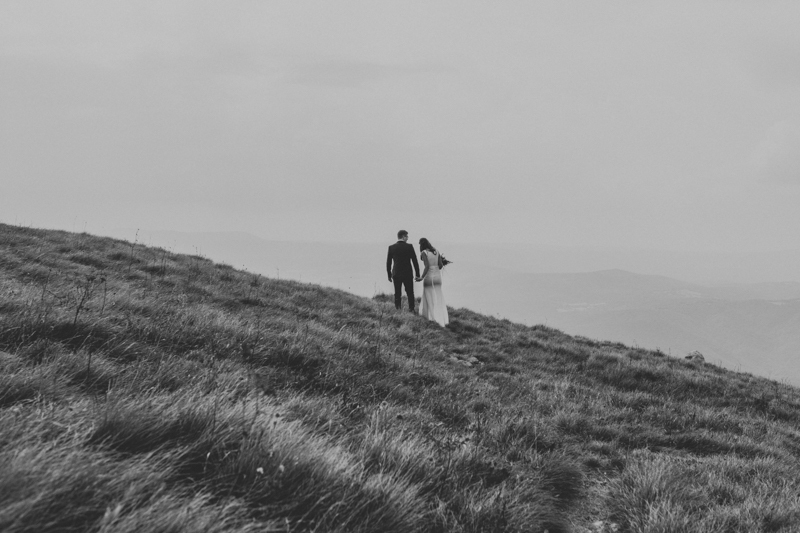 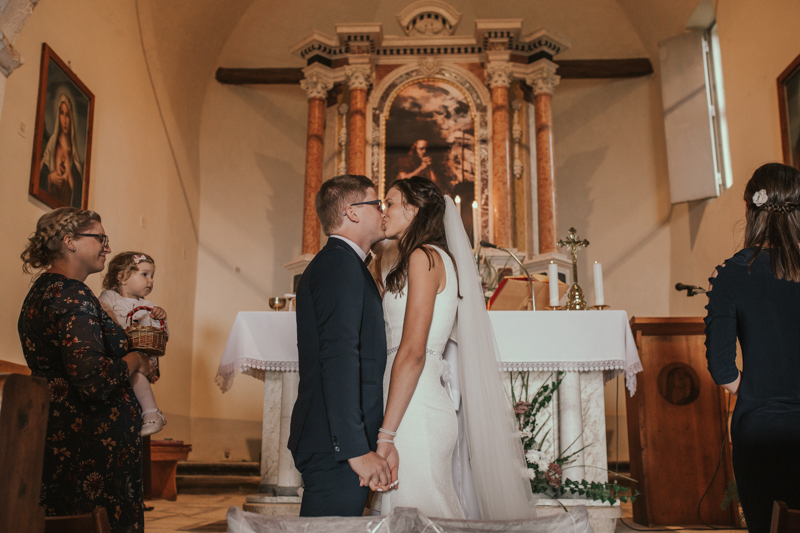 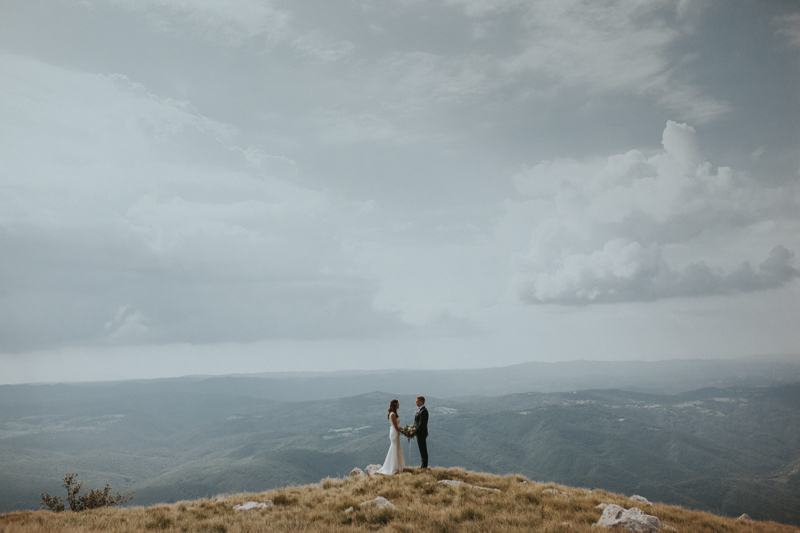 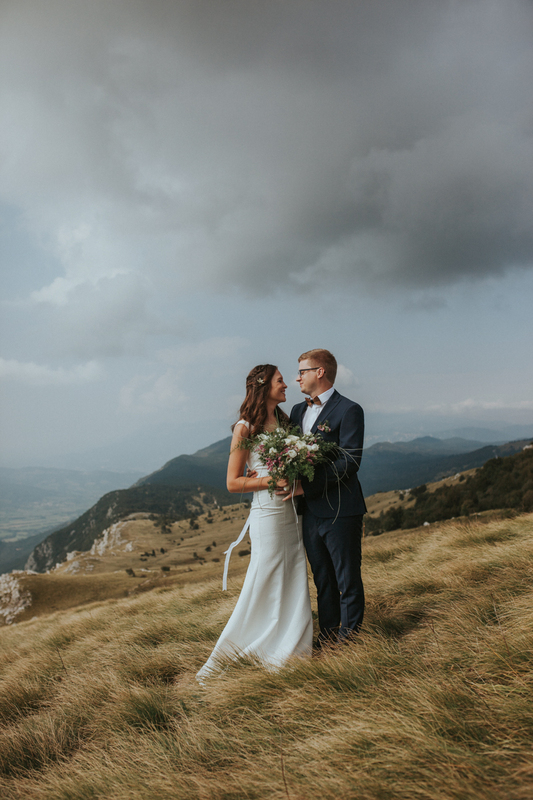 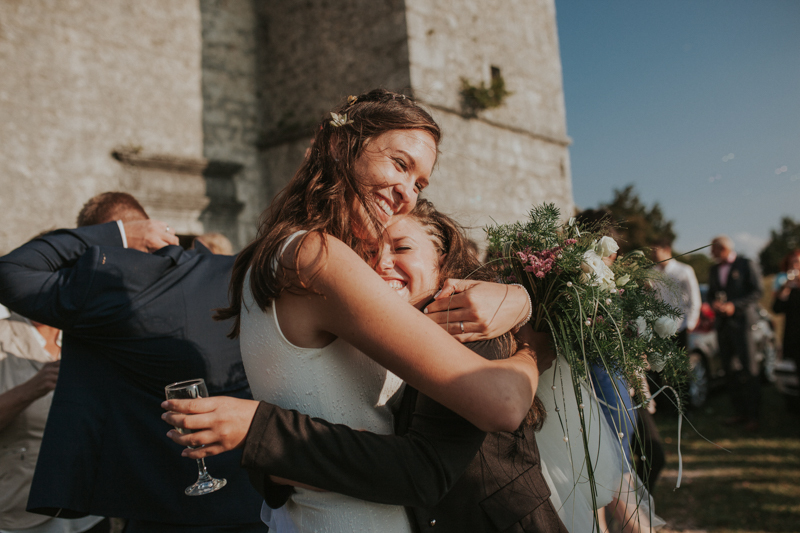 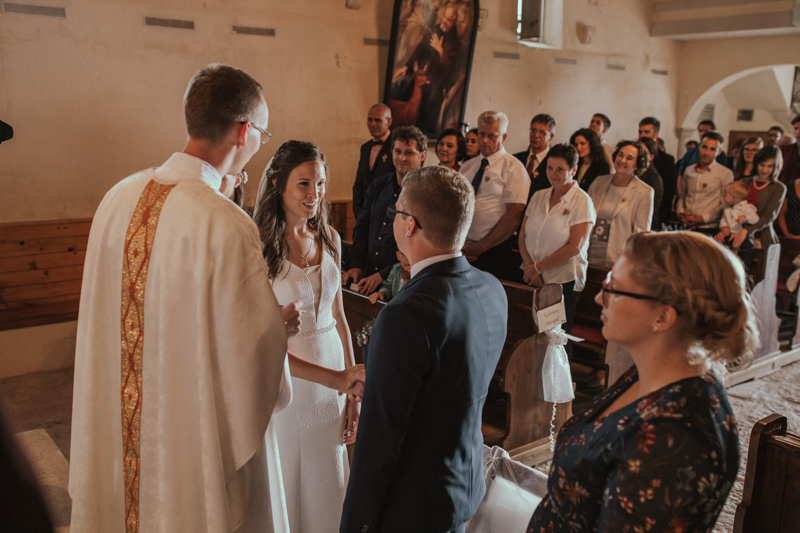 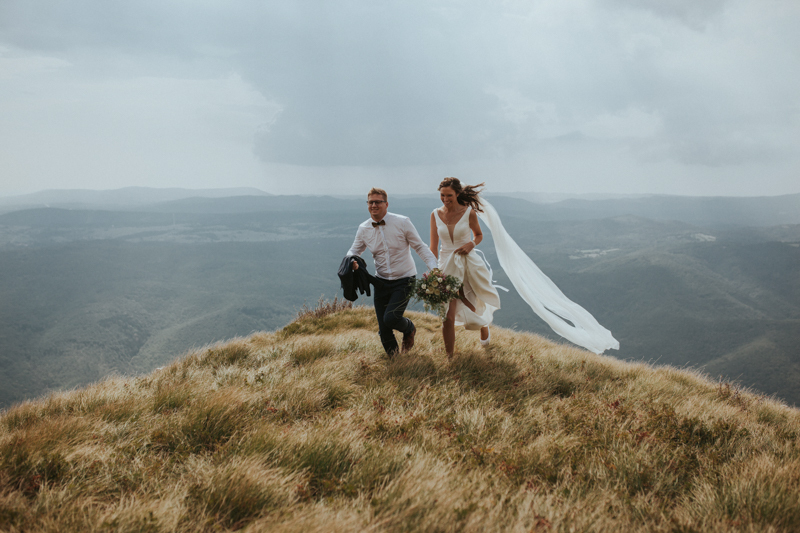 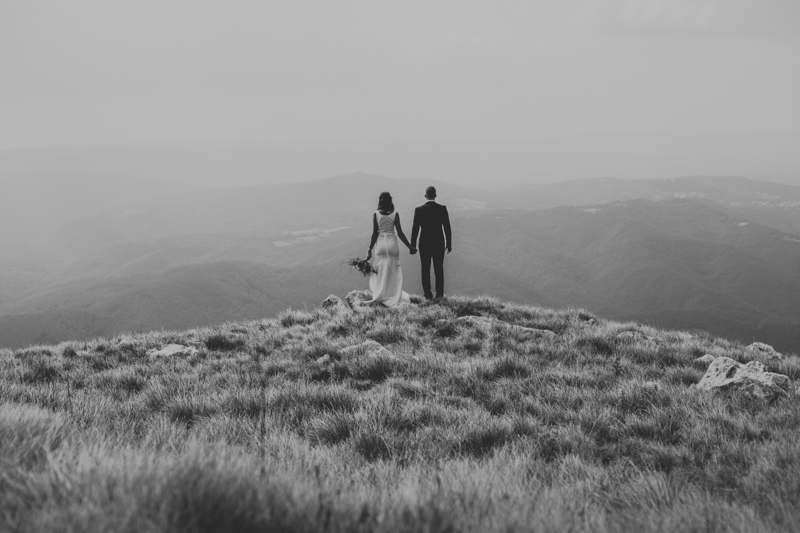 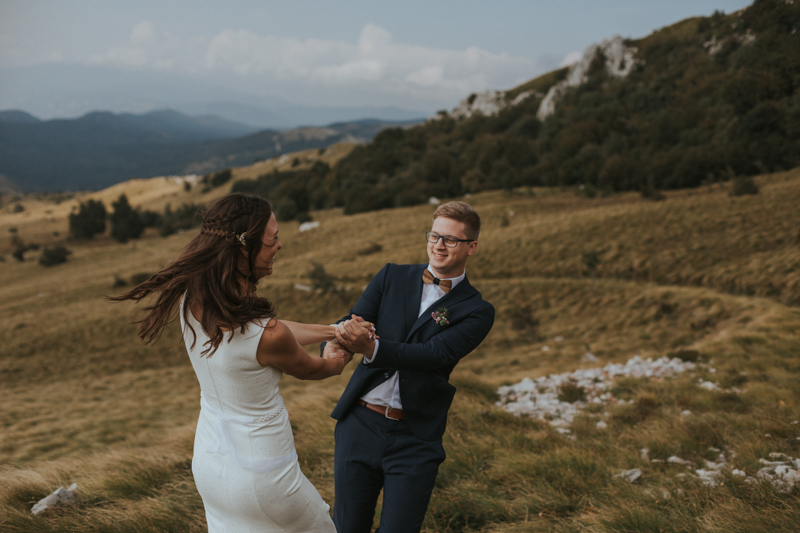 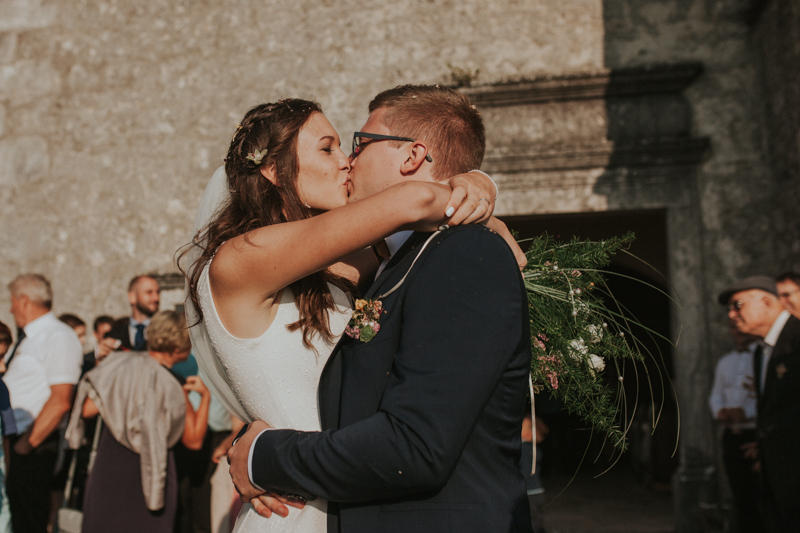 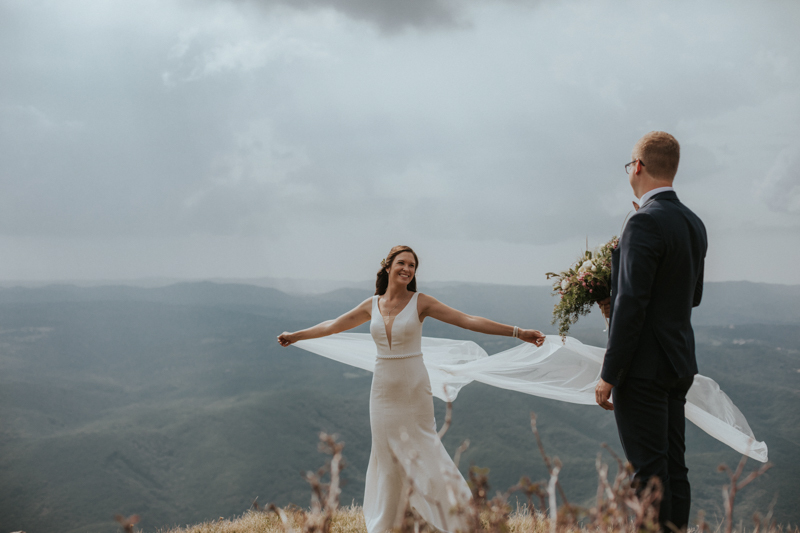 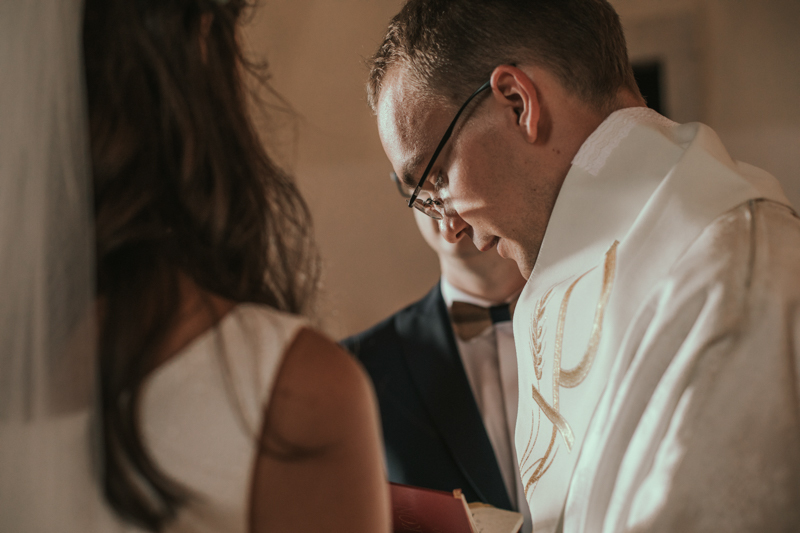 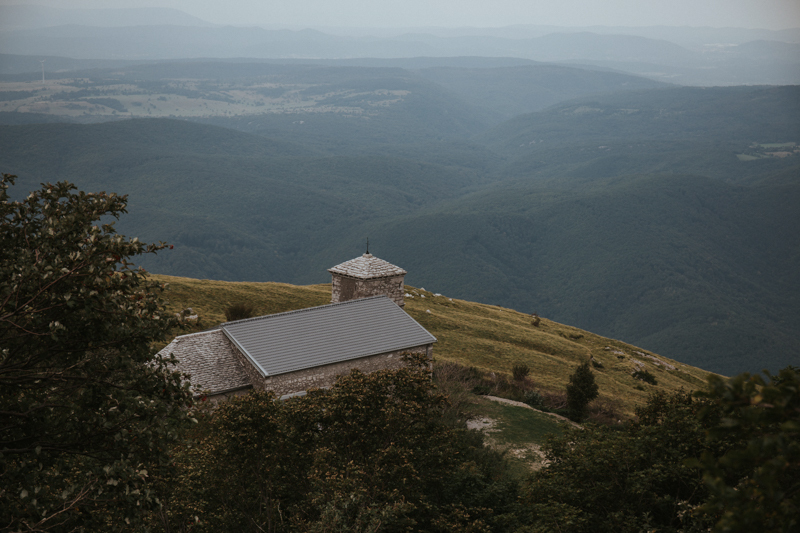 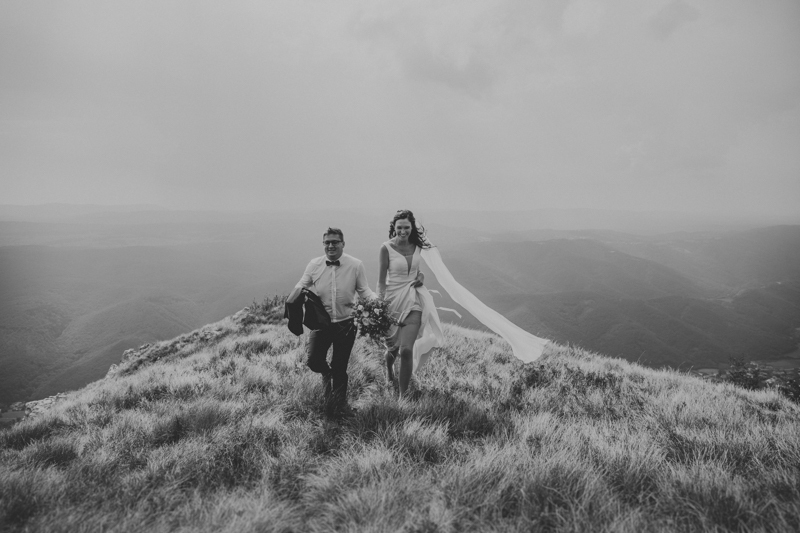 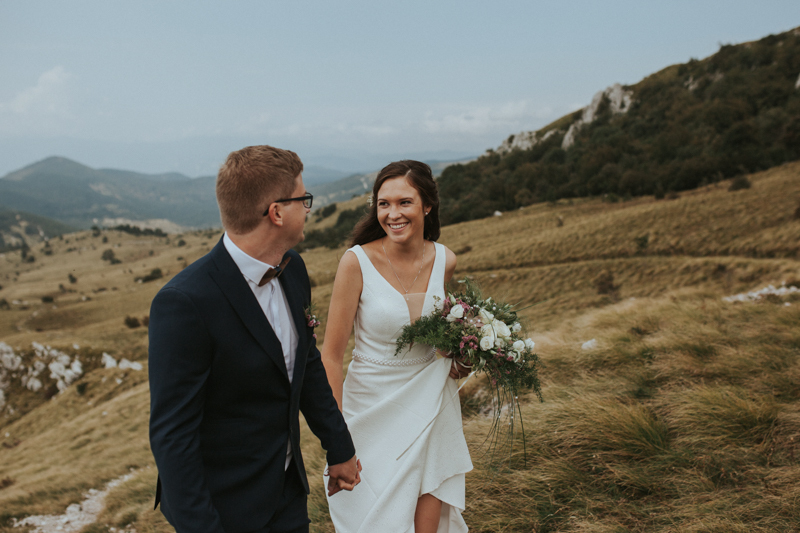 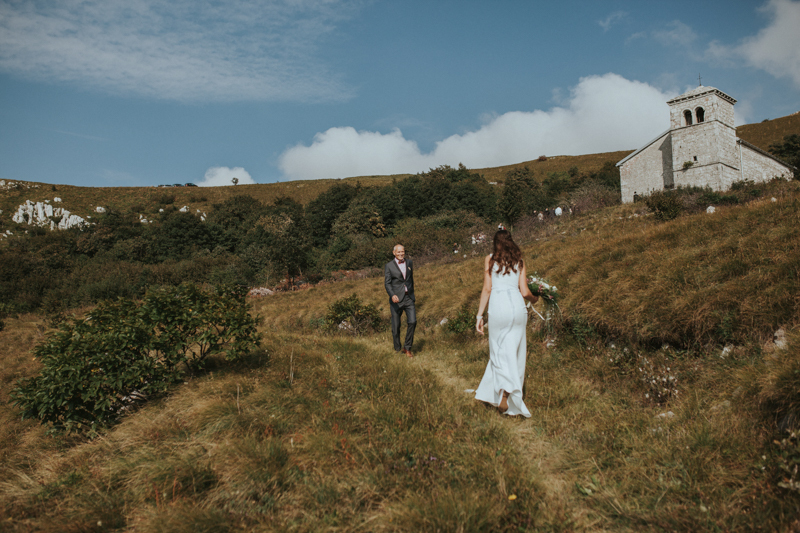 They chose a place very dear to them – a stone church at a very unique location up in the highlands, overlooking Vipava valley. 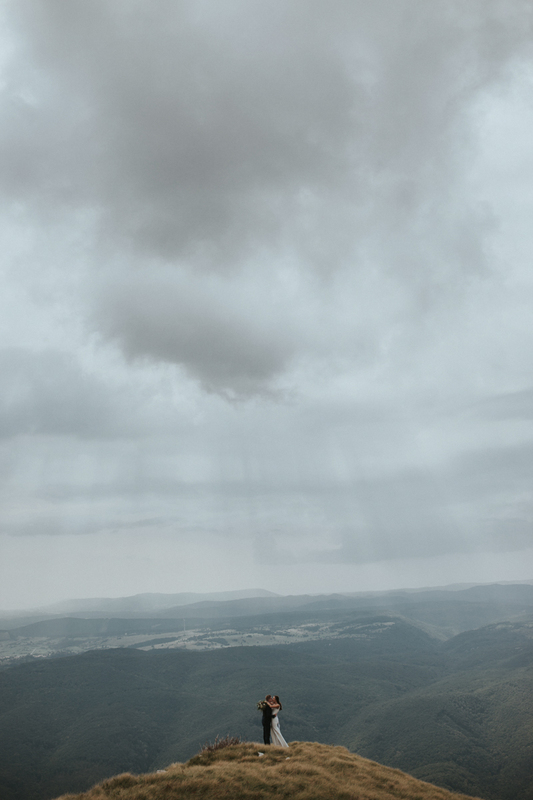 The only real concern was the everchanging weather forecast as storms can get really tricky up there. 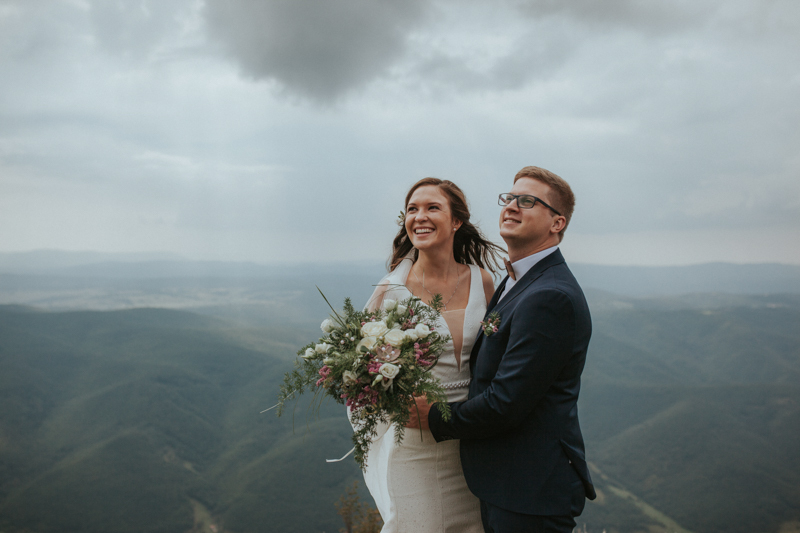 The last day they called the meteorological service and asked: “Will the weather hold?” They answered: “Well, hard to say for certain”. 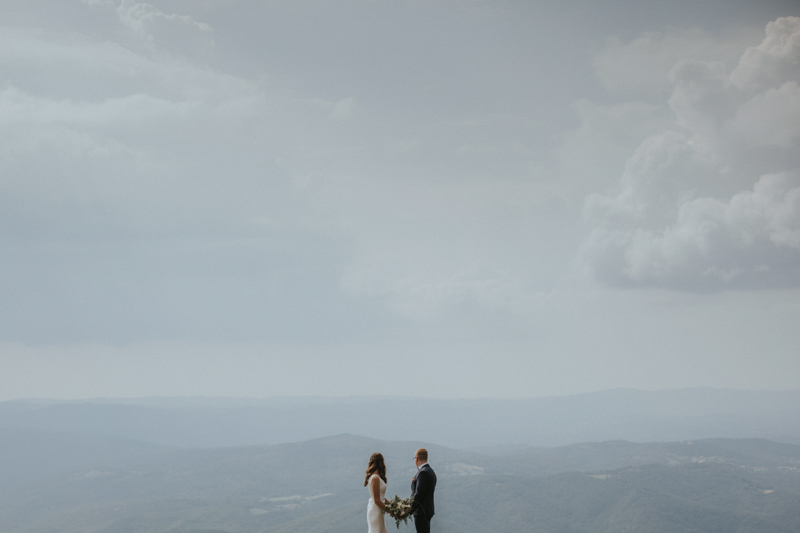 “But we’re having a wedding up there!” she said, and they responded: “Oh, a wedding! 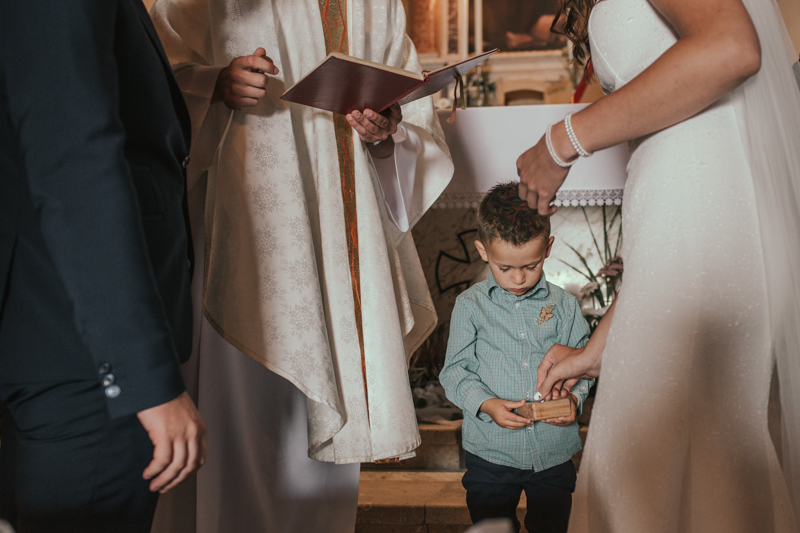 Well in that case, it will hold!”: And it did. 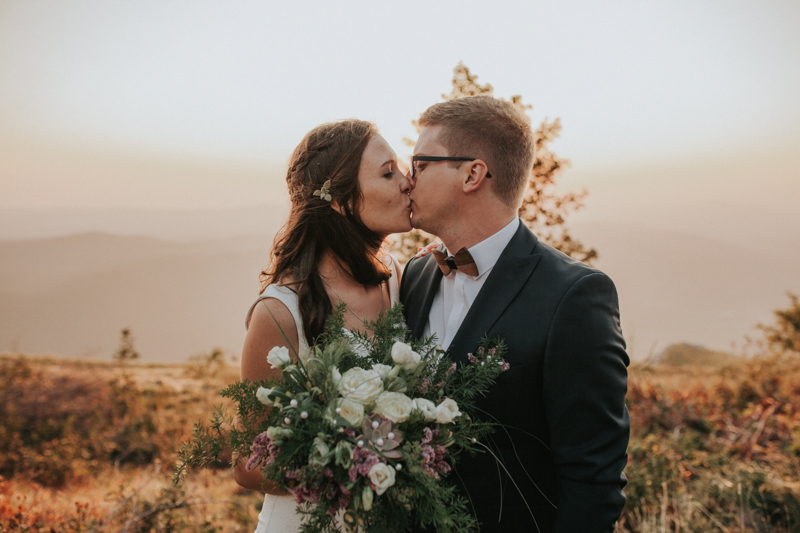 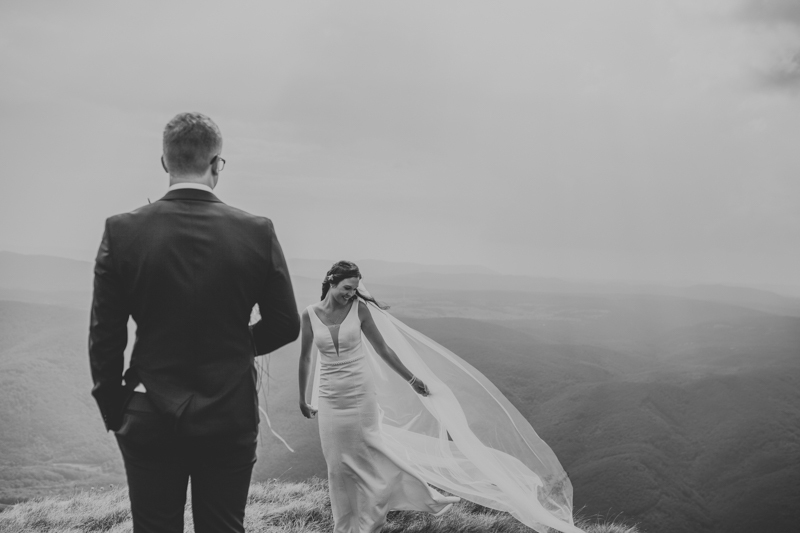 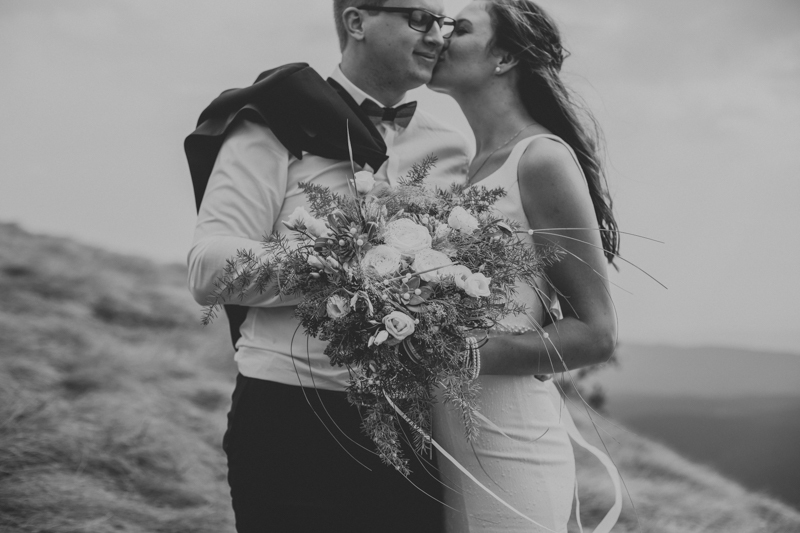 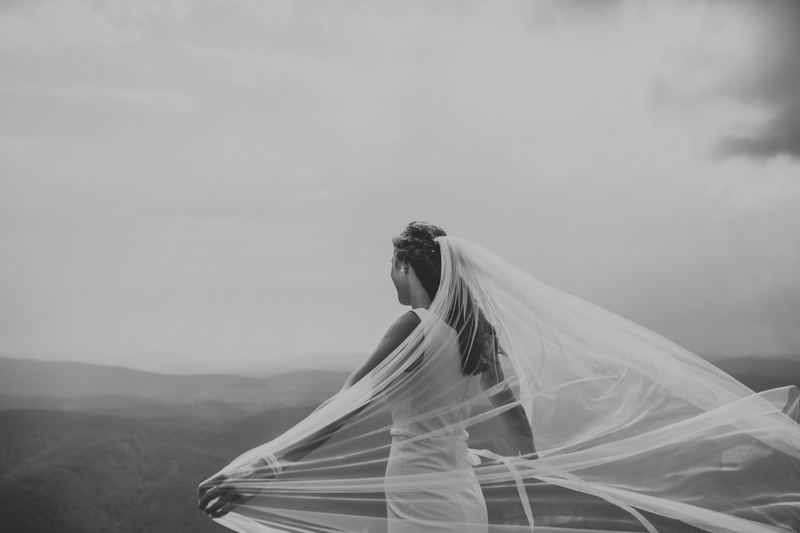 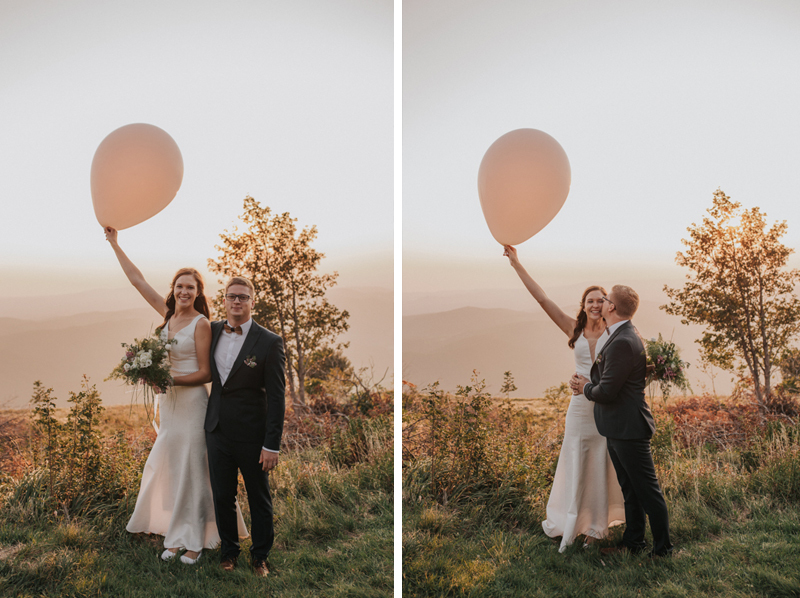 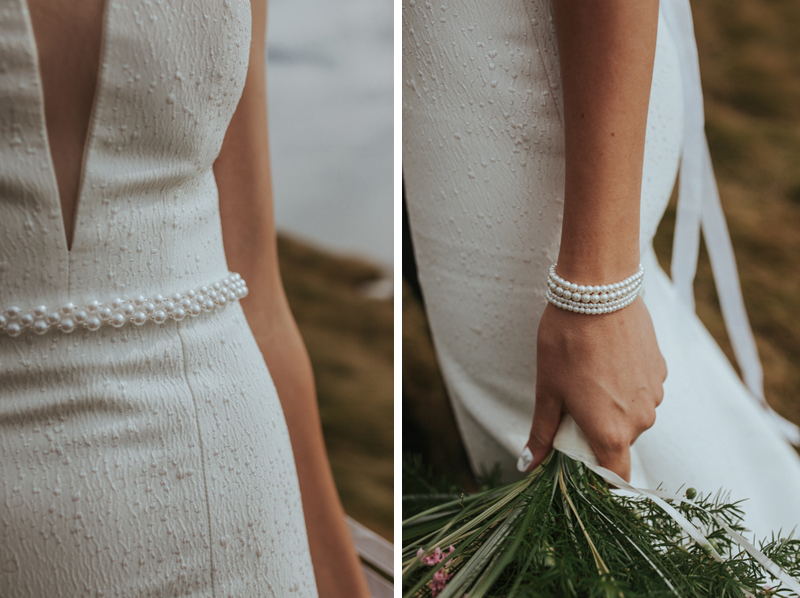 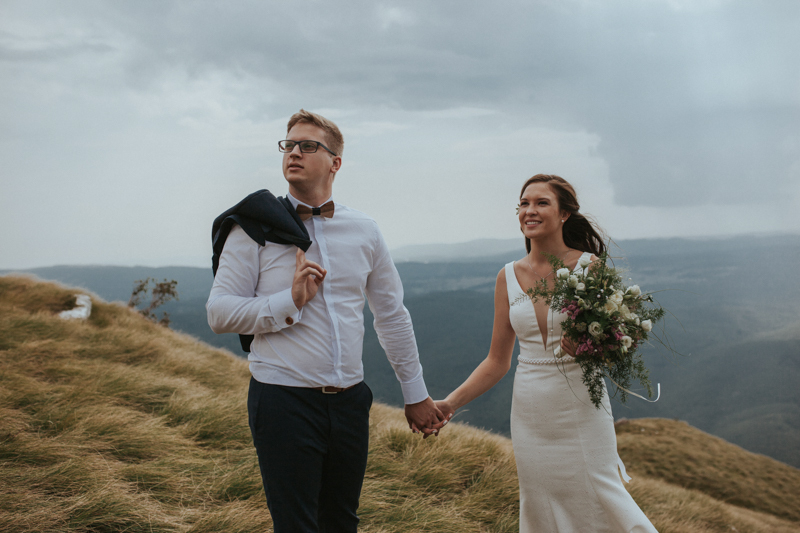 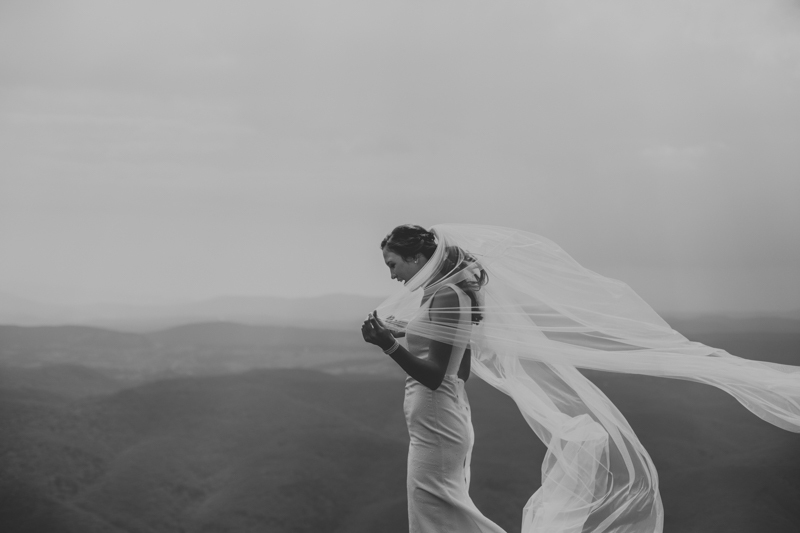 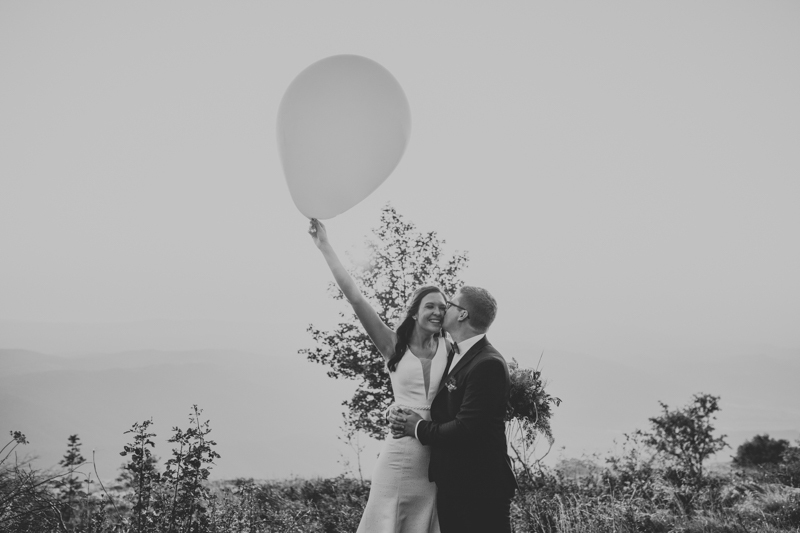 At that point, nothing else could spoil this beautiful intimate highlands wedding. 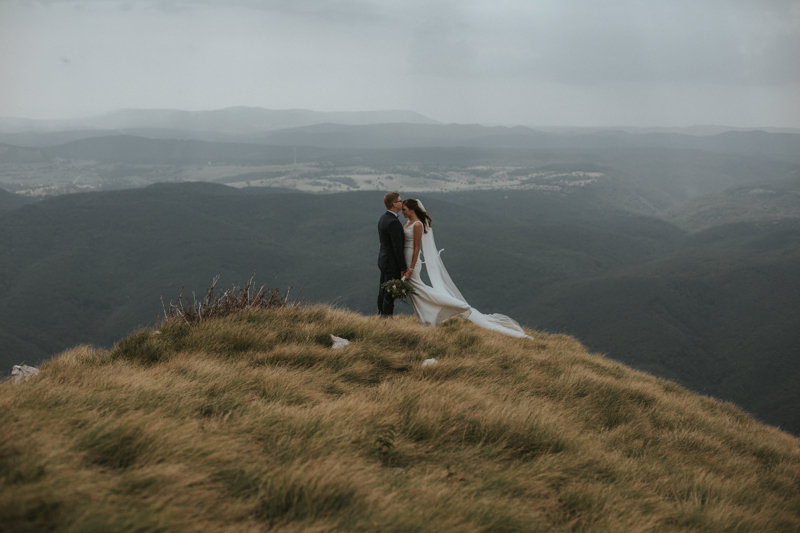 We were driving up the hill. 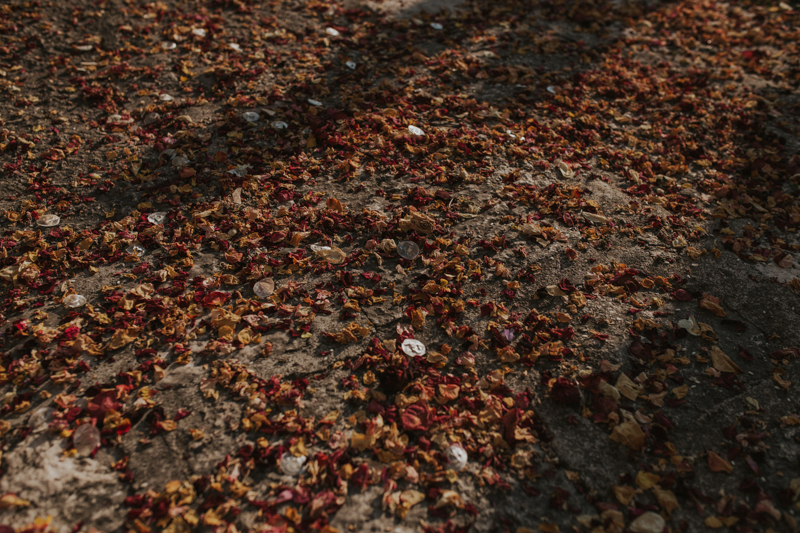 The unpaved road seemed to be getting narrower and less driven. 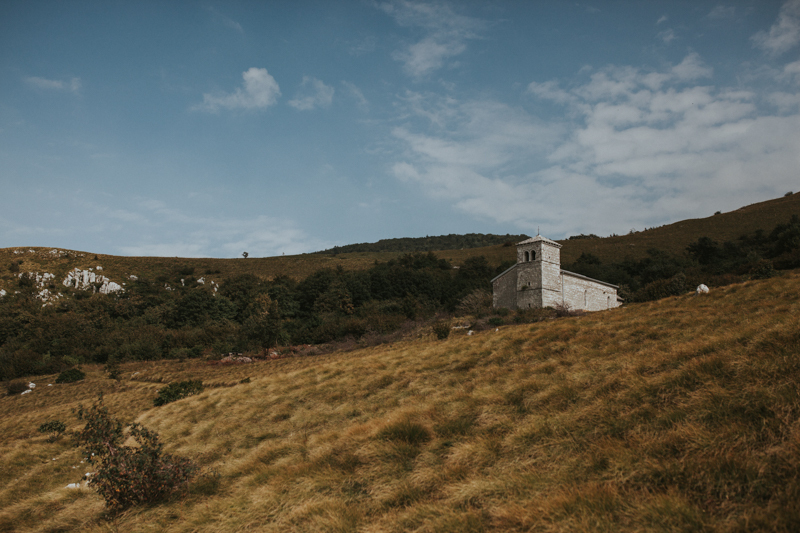 Just as we were to start wondering if we were still going in the right direction, we noticed an improvised parking lot and this picturesque church peeked out between the trees. 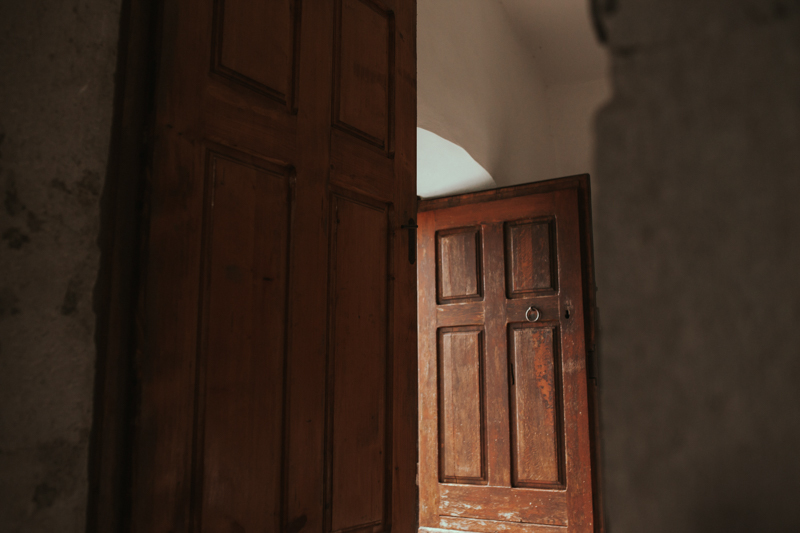 A breathtaking view opened up. 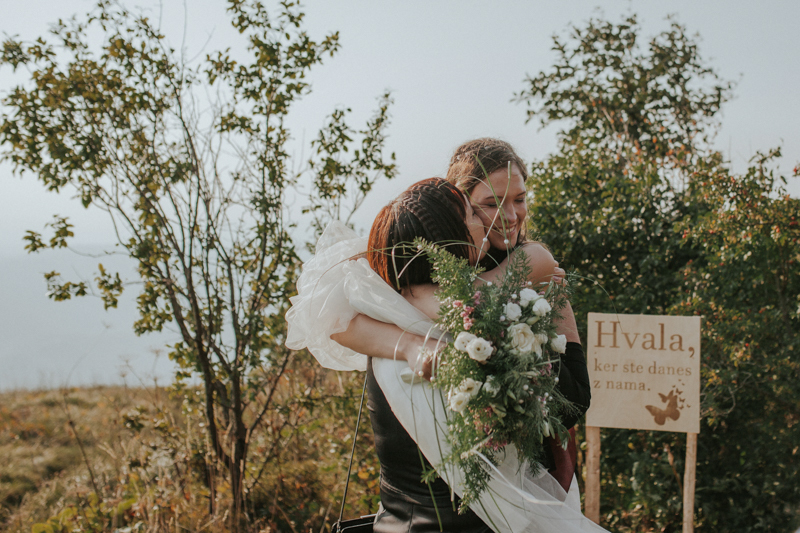 We were there for the first time but we felt like we’d never want to leave. 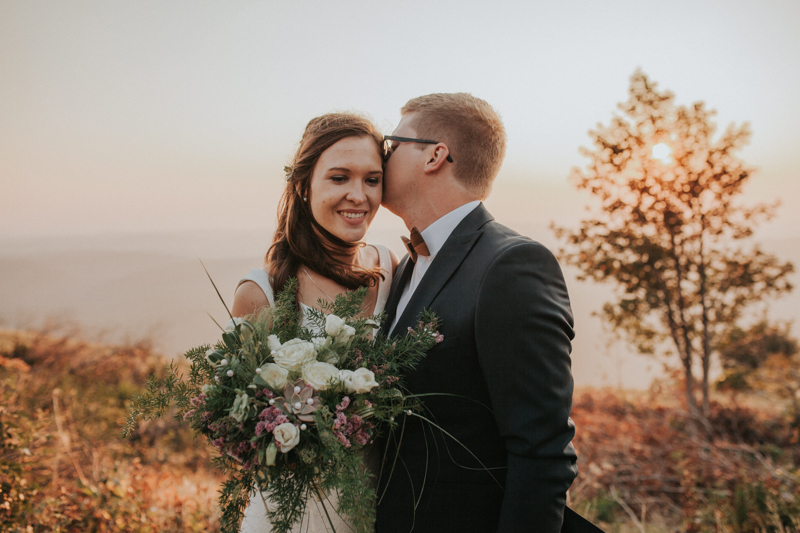 A beautiful afternoon unveiled. 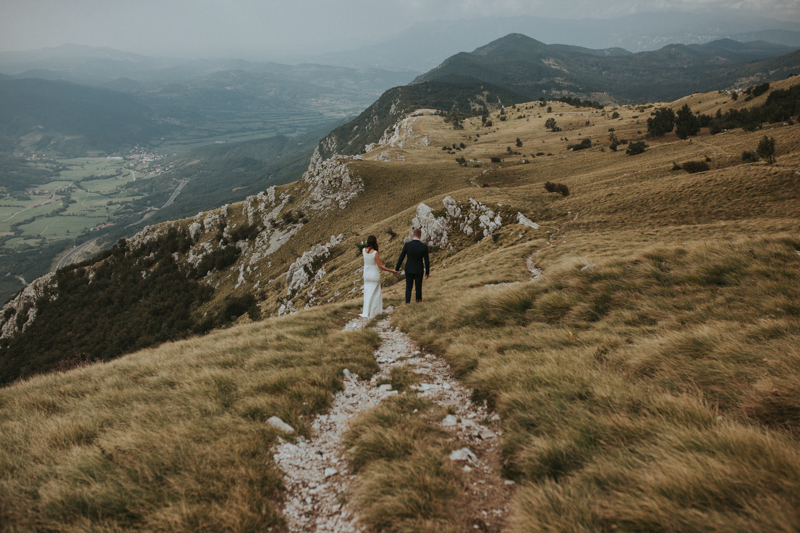 The couple first took some alone time, walking and running around and simply enjoying their moments together. 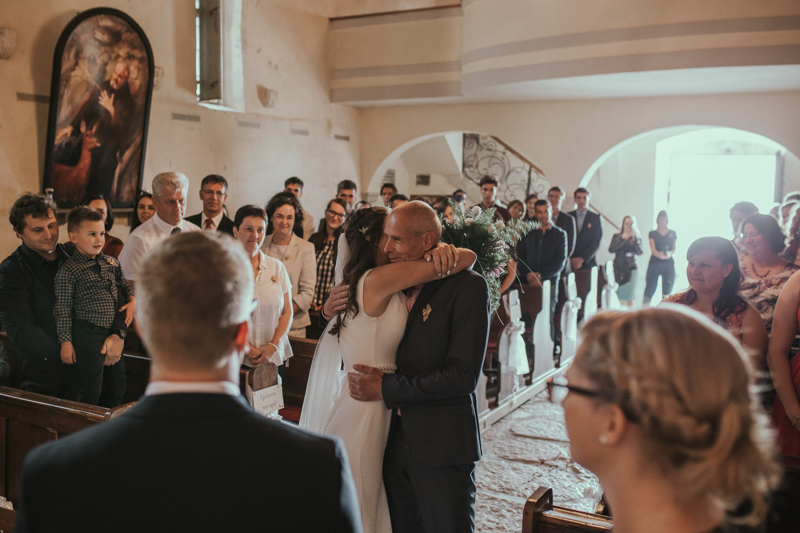 After that father came to walk the bride up to the church, surely one of the most special “down the aisle” walks we’ve witnessed. 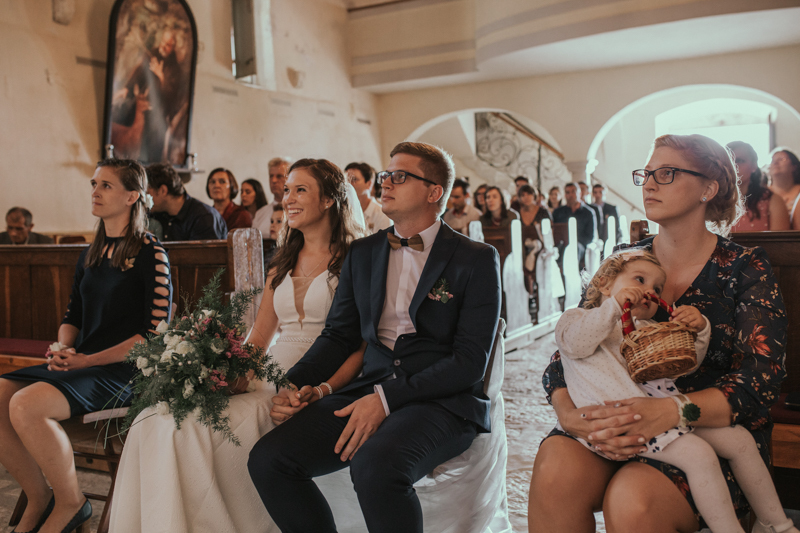 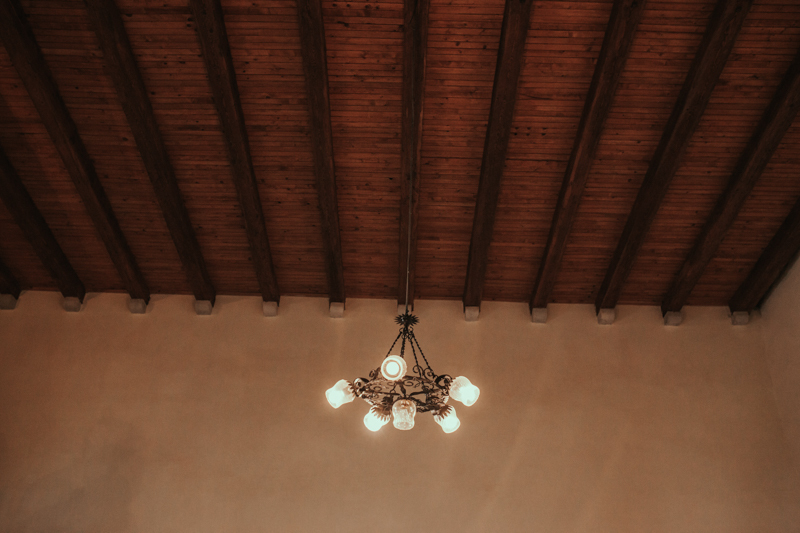 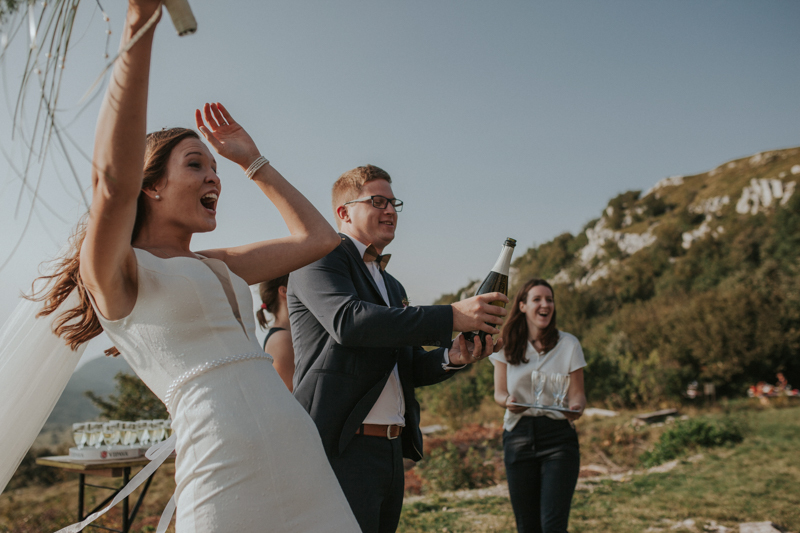 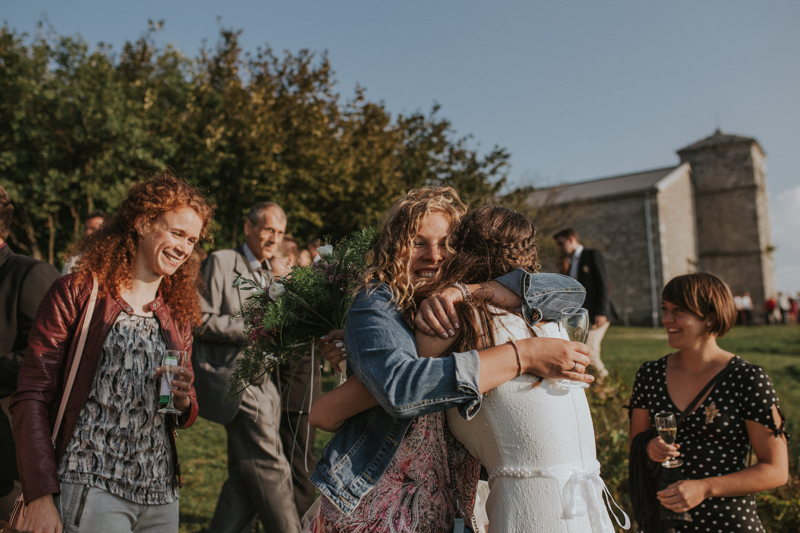 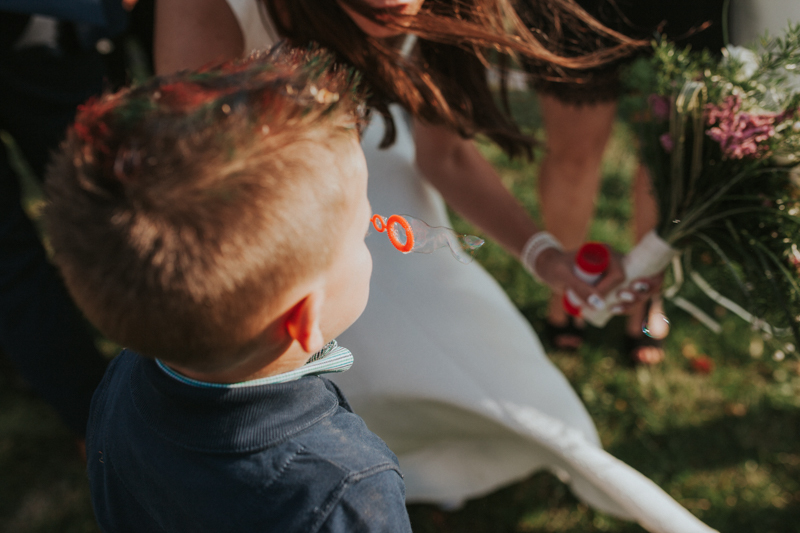 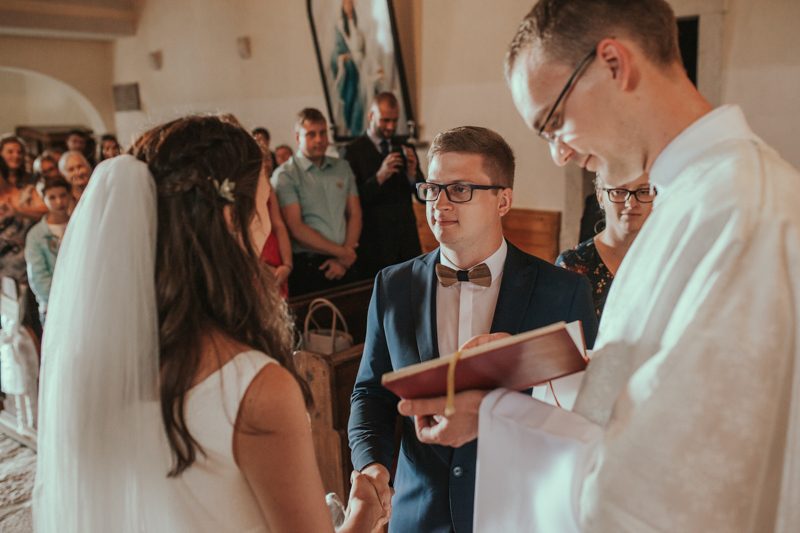 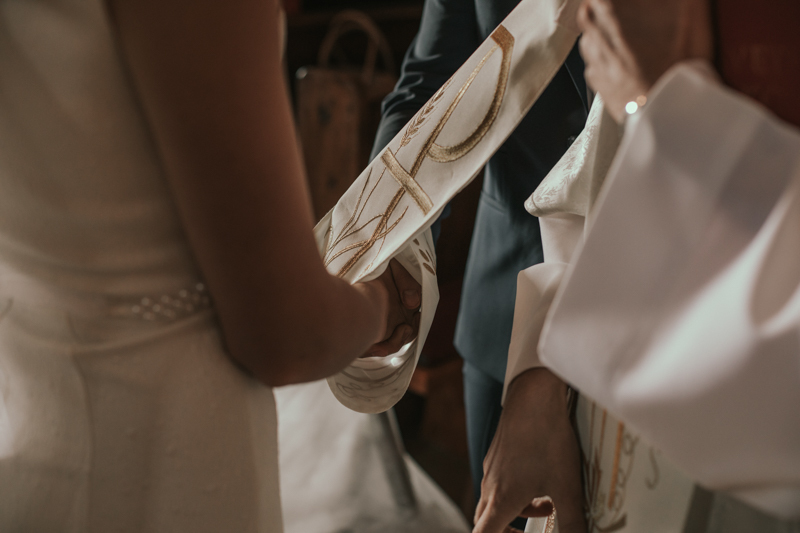 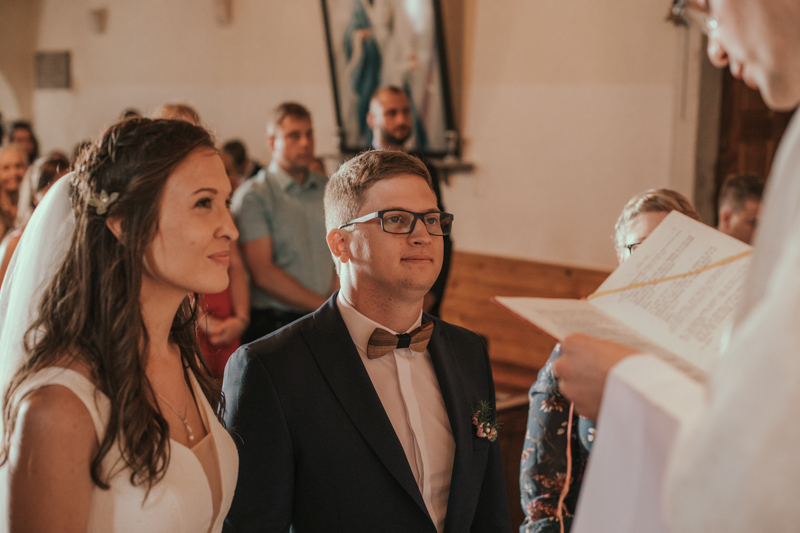 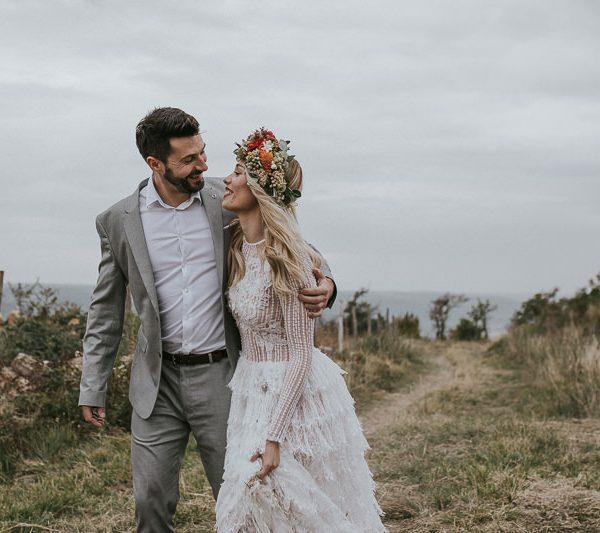 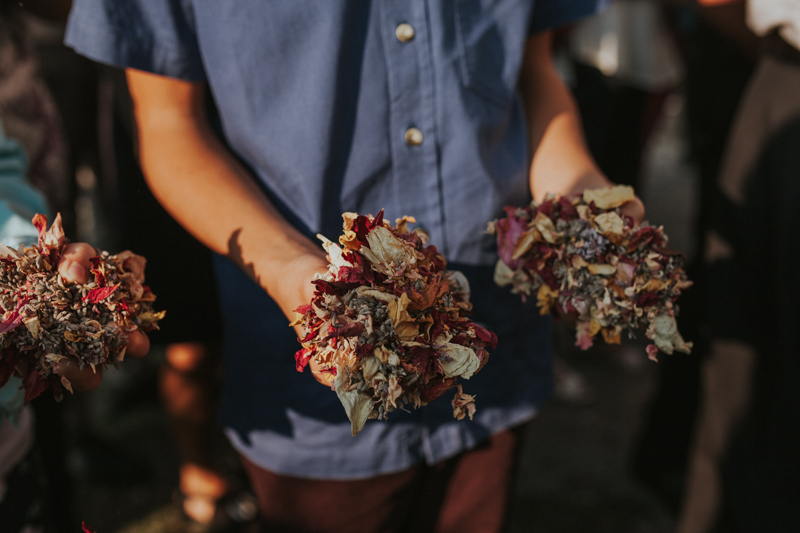 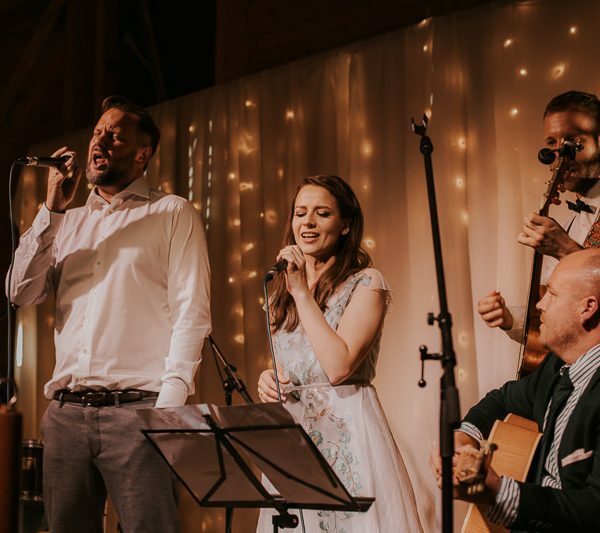 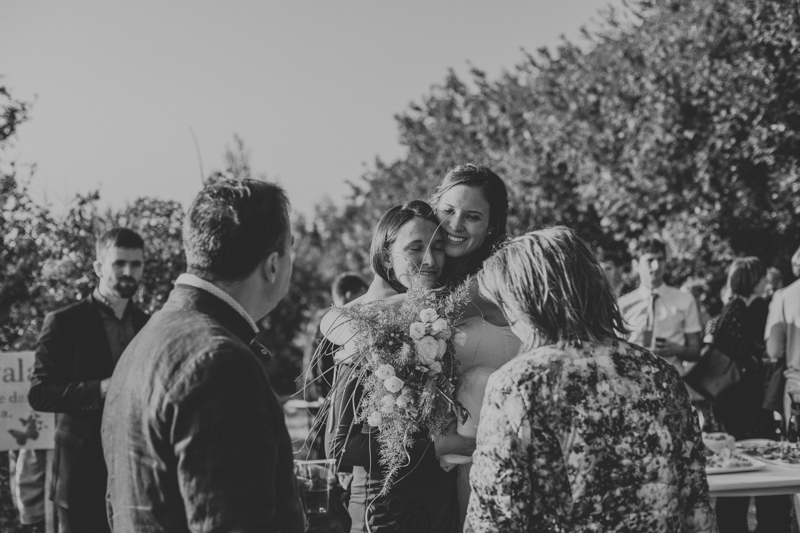 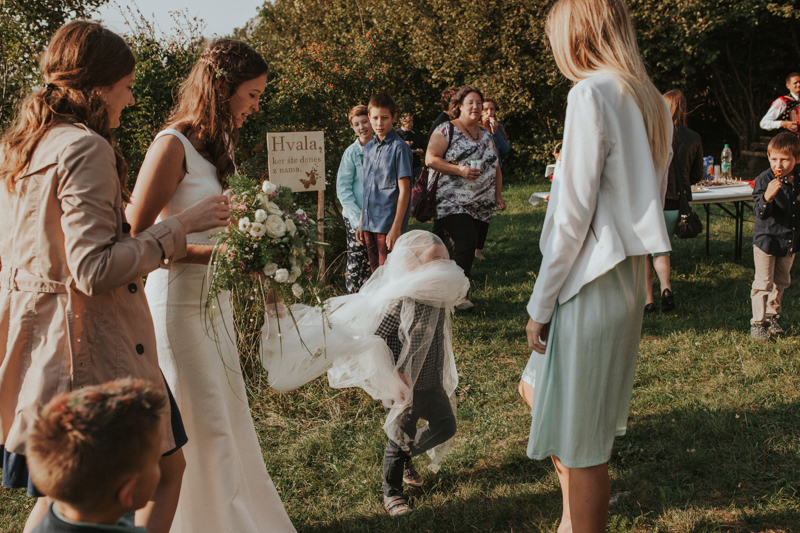 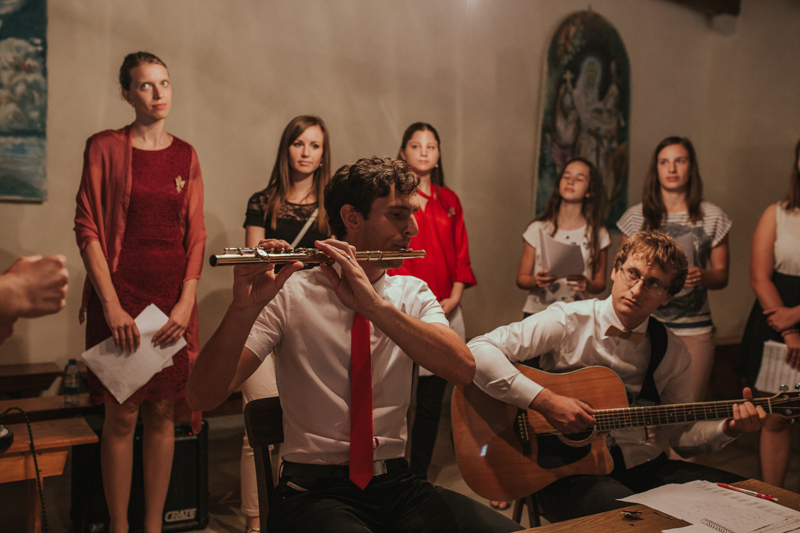 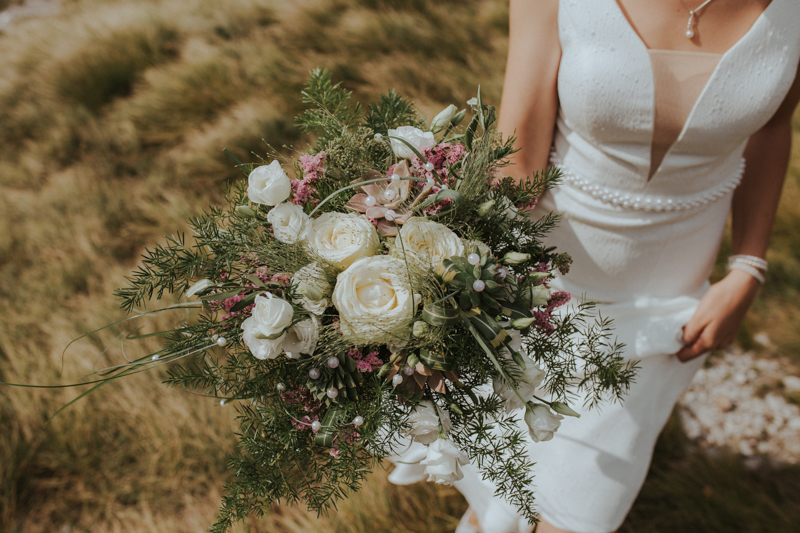 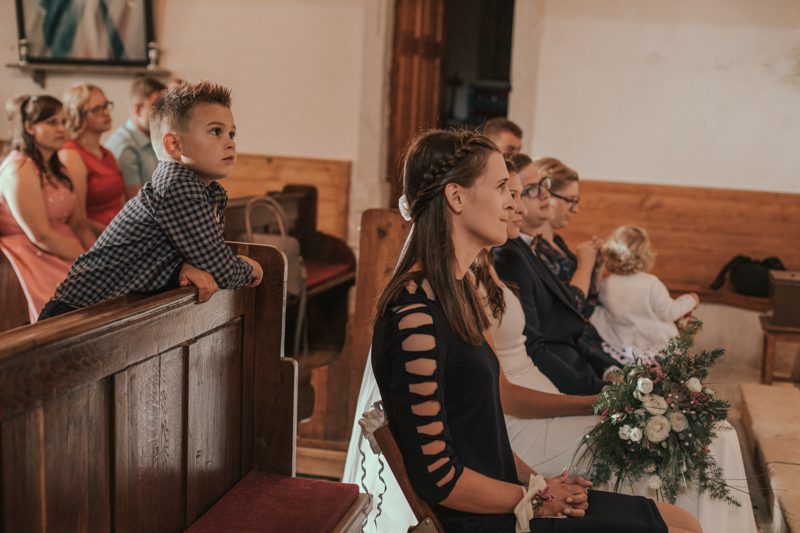 Although there was quite a number of close friends and relatives present at the wedding, the whole ceremony had such an intimate and relaxed vibe to it. 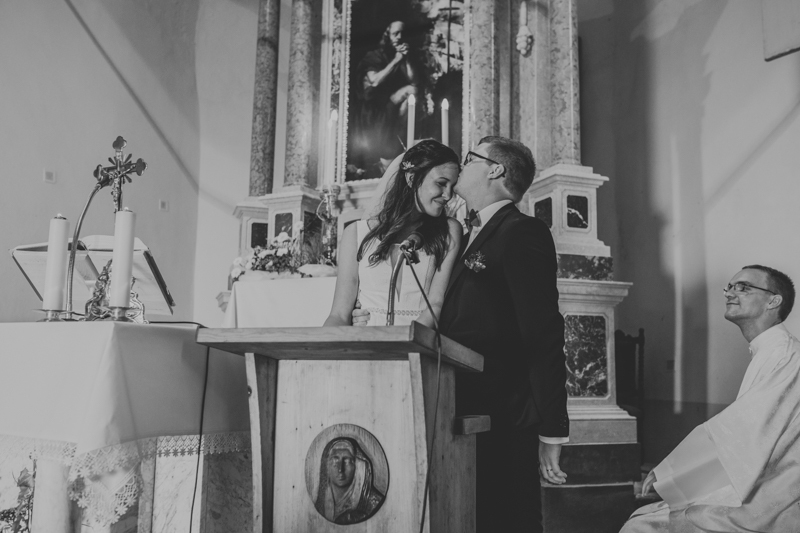 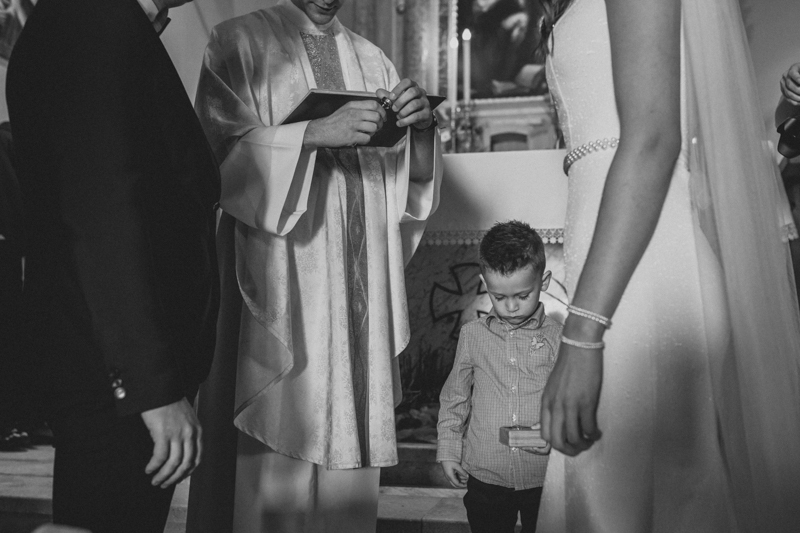 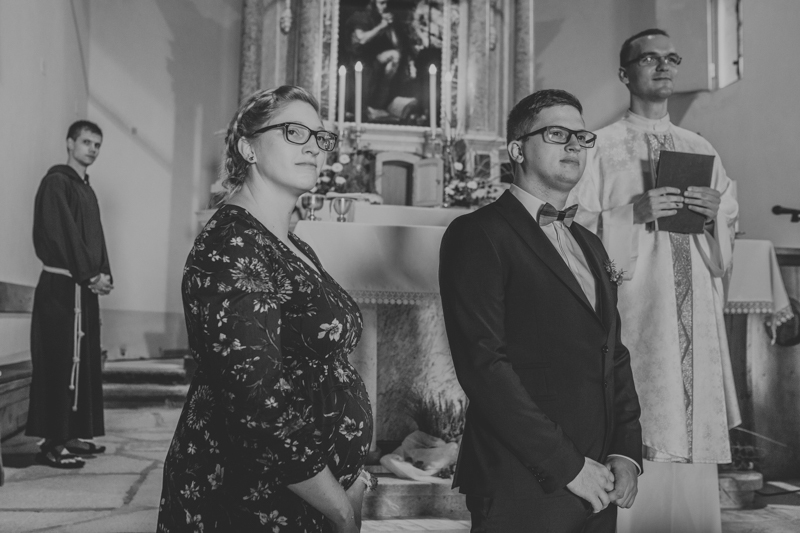 The priest was groom and bride’s friend which reflected in his speeches and added another extra personal touch. 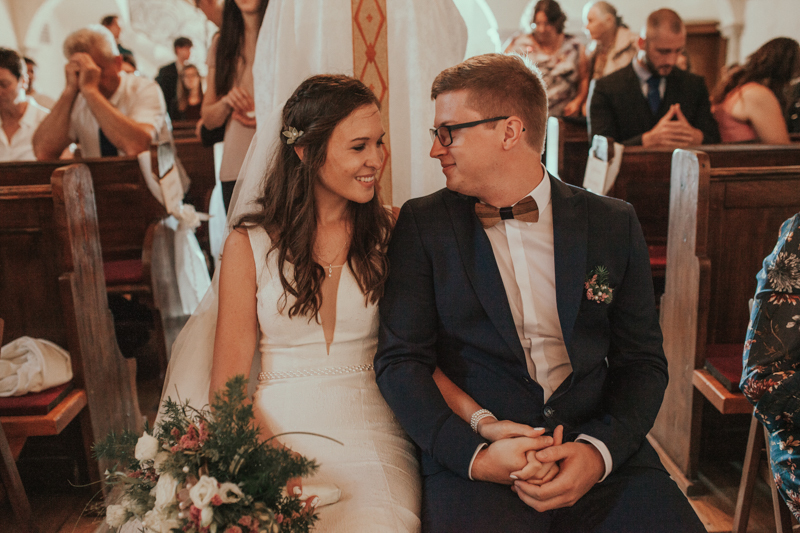 It was beautiful to see how everyone was so happy for the couple. 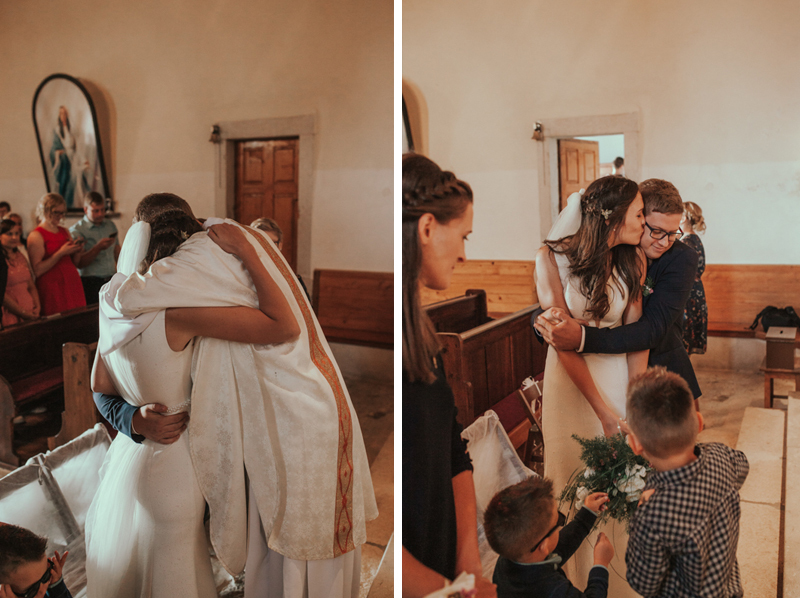 These genuine tears, laugh and warm embraces that both of them will be able to remember dearly. 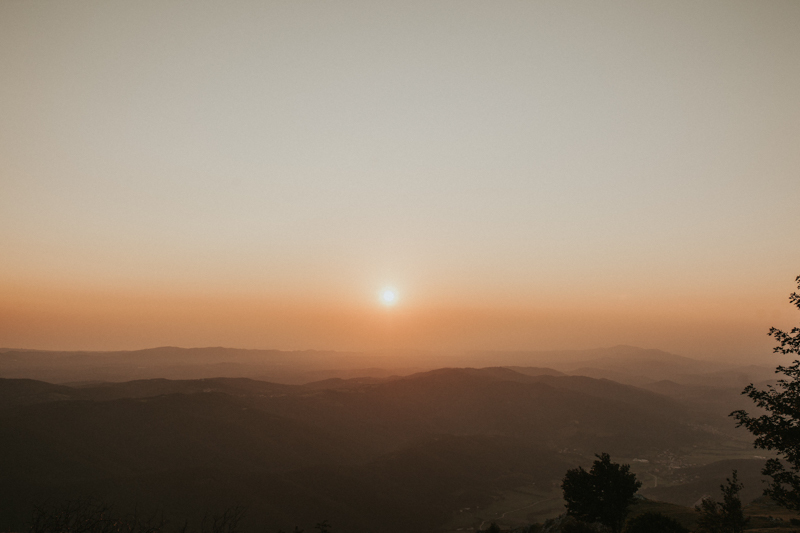 The sunset hour just seemed to have arrived too soon. 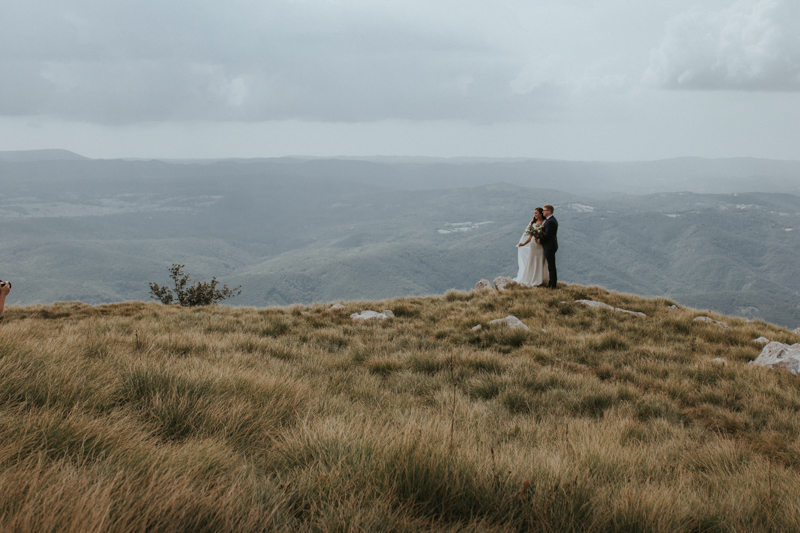 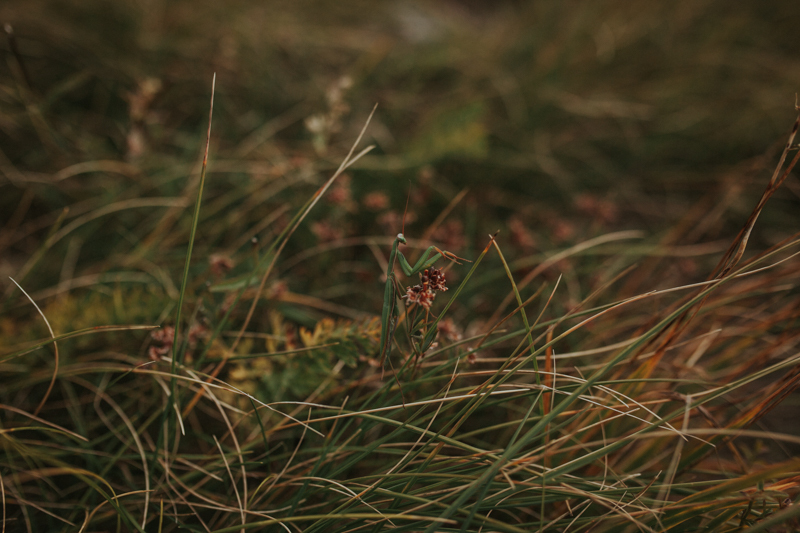 We sat there in the car in silence, watching the light quickly disappearing as the guests were walking up the steep path. 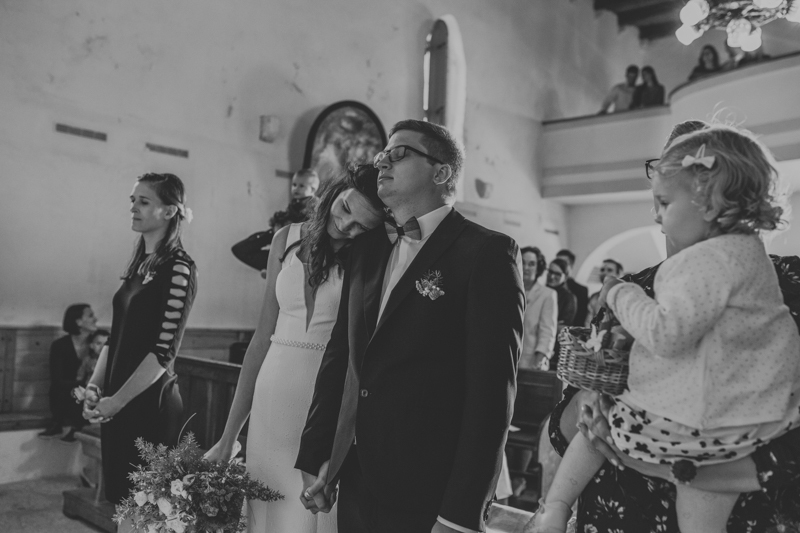 We thought to ourselves how grateful we can be for days like this. 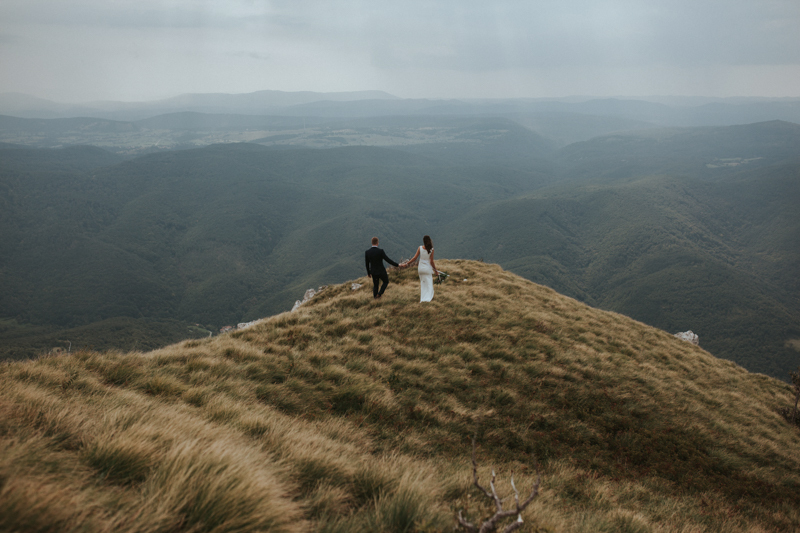 And how blessed we were to be a part of such a beautiful intimate highlands wedding. 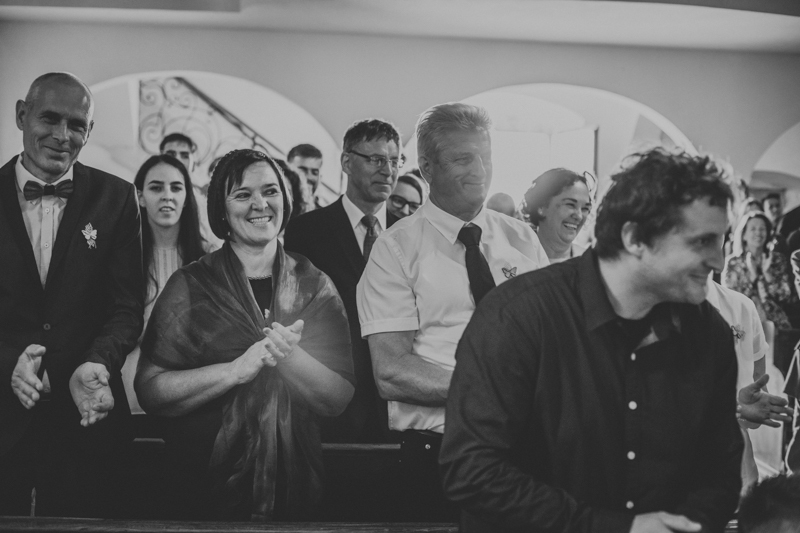 It will always keep a special place in our heart for its really special energy and the wonderful people that created it.